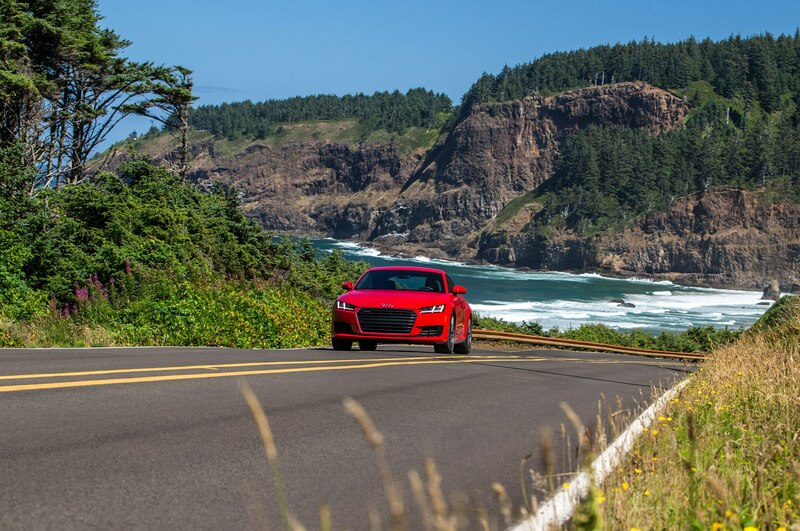 A massive cloud of dust is spewing from the car in front of us, obscuring our view as we hammer down a washboard, parched stretch of dirt road outside of Bend, Oregon. We have two kids in the back, their dad riding shotgun, and a gripload of gear in their trunk. 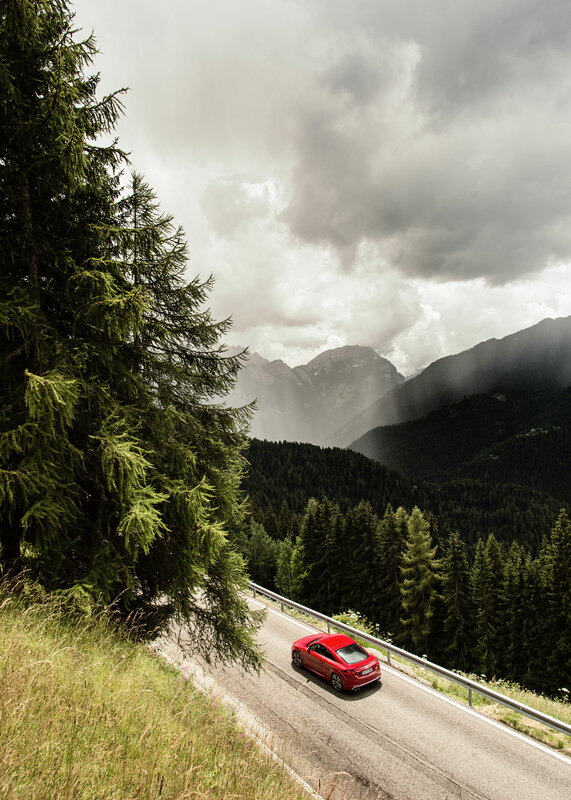 We’re clearly ready for a day at the nearby lake. 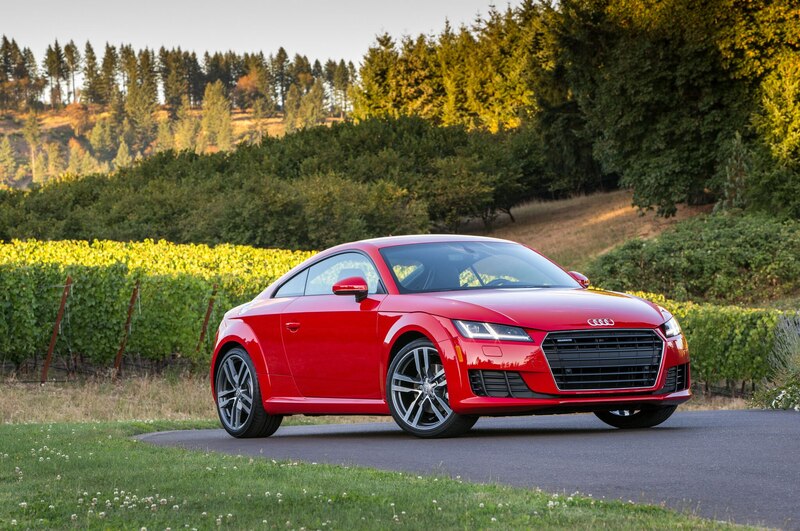 Oh yeah, and we’re driving a brand spanking new 2016 Audi TT coupe. 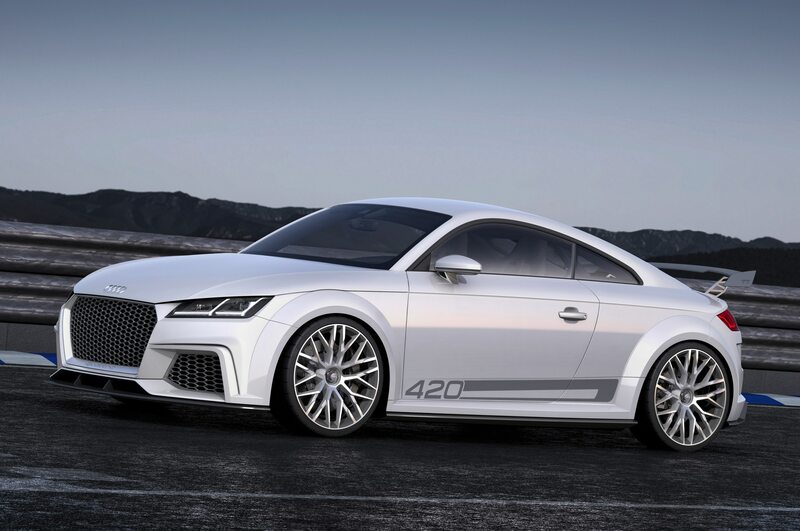 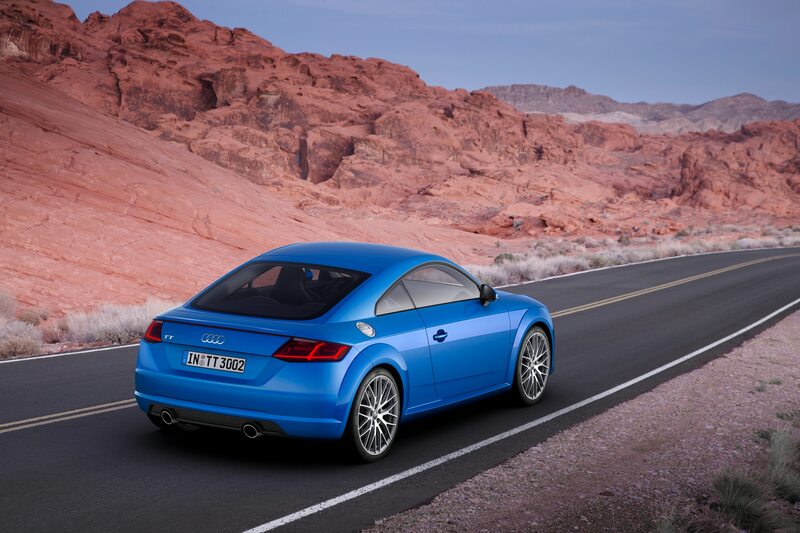 Not exactly a top-of-mind use of the third-generation model of the Audi TT. 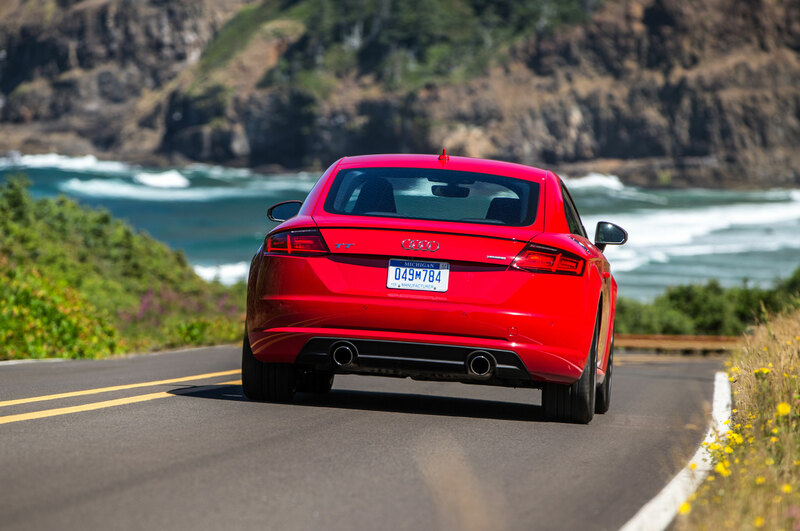 As my 6-year-old nephew says, “It’s a sports cah!” But what the dirt-road excursion proves is 1) the TT’s rear seats can actually fit humans under the age of 10 in comfort, 2) you can easily use the new TT for stuff other than terrorizing asphalt. 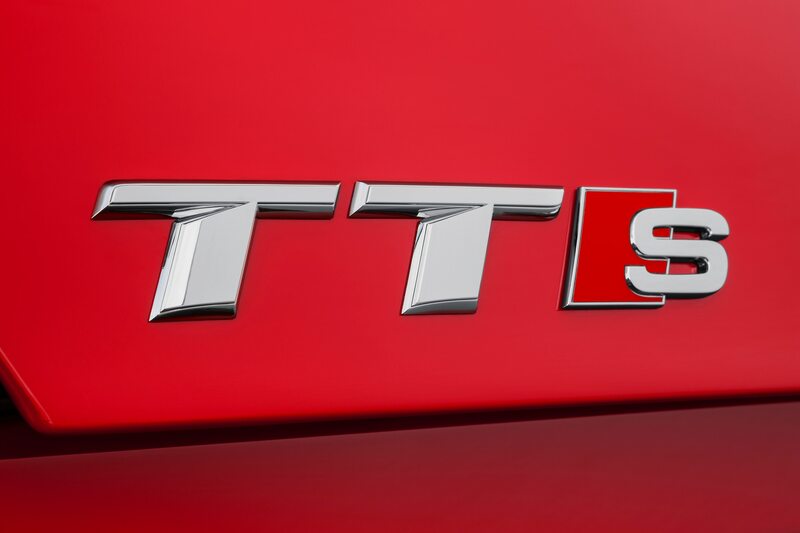 Audi officials agree with my nephew that the TT is a real sports car. 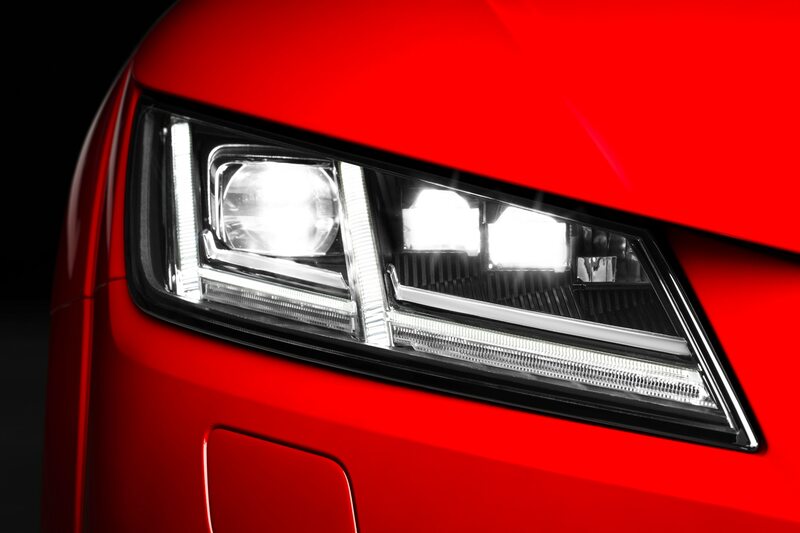 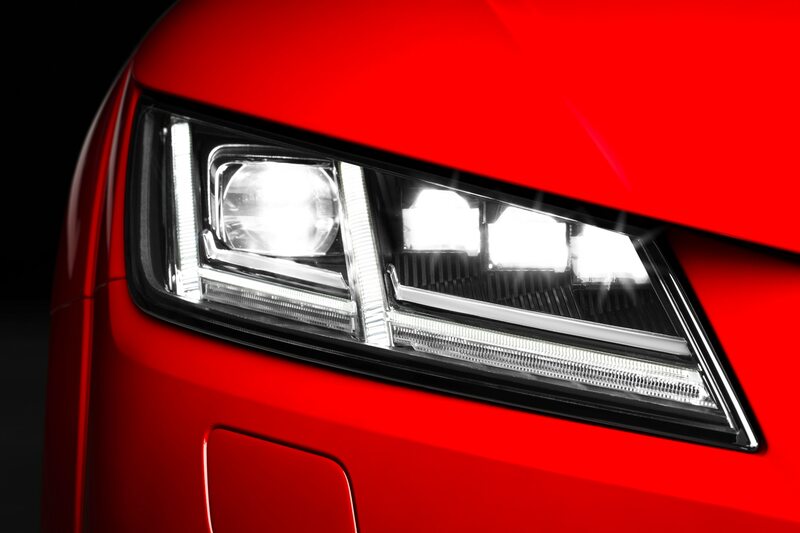 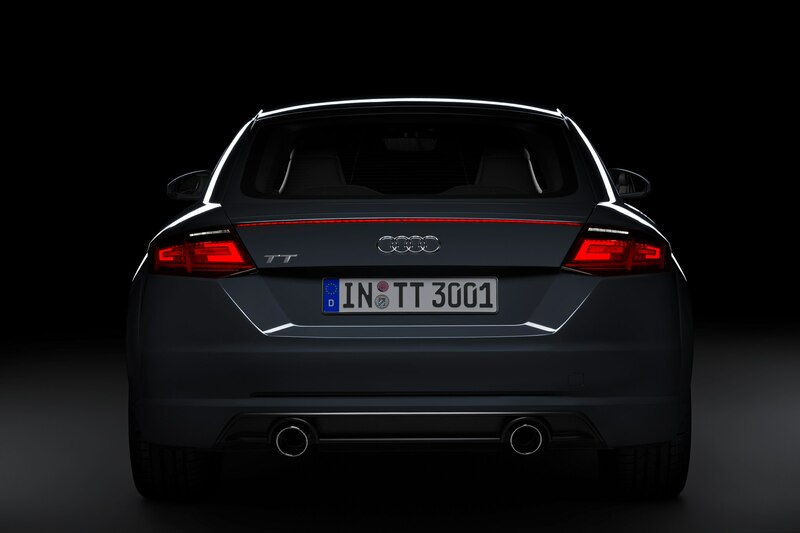 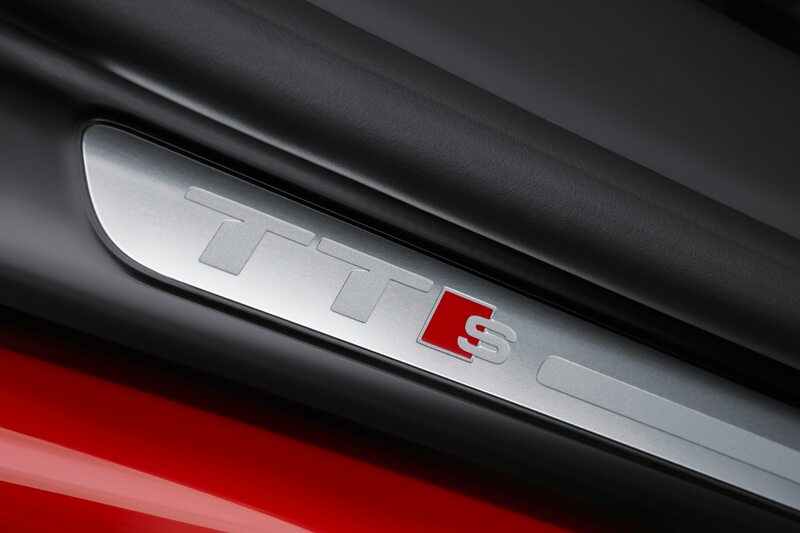 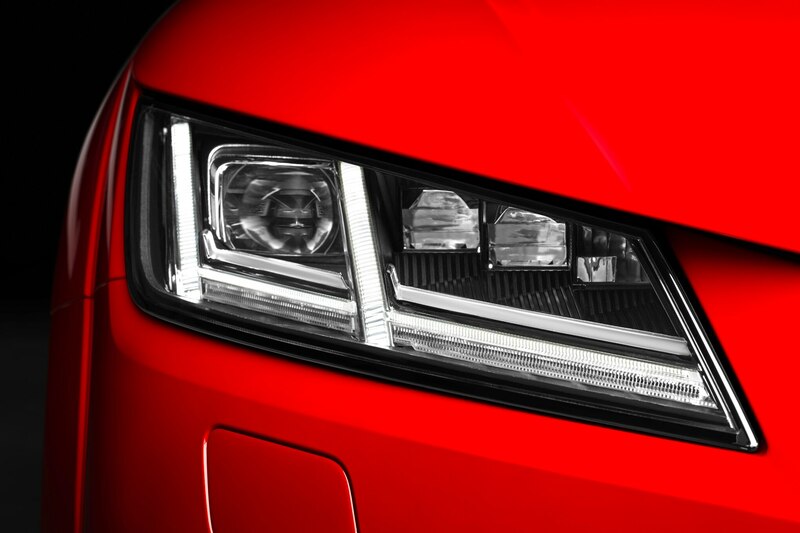 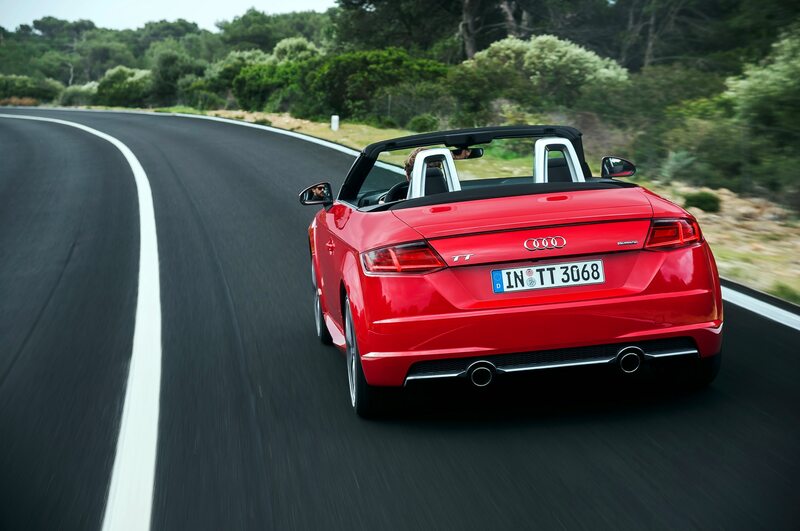 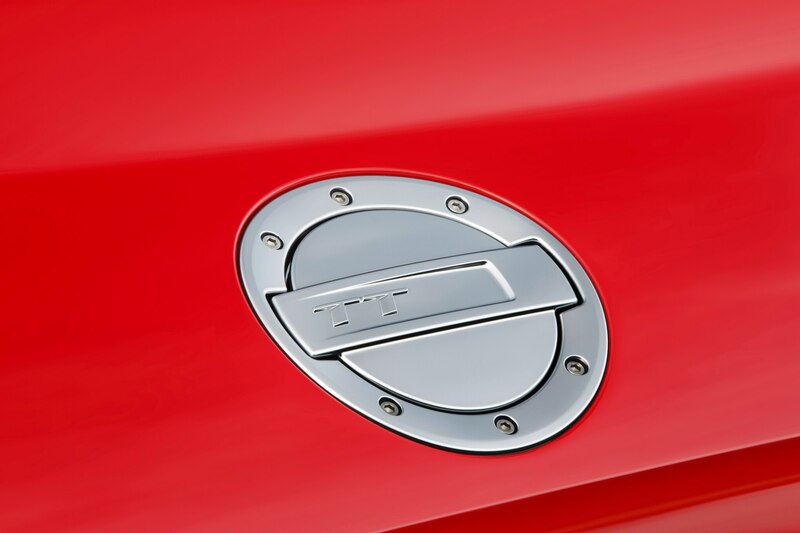 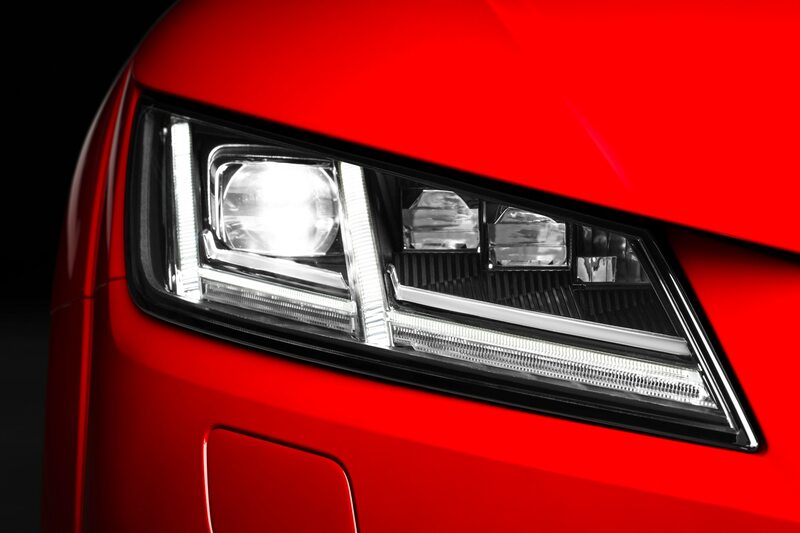 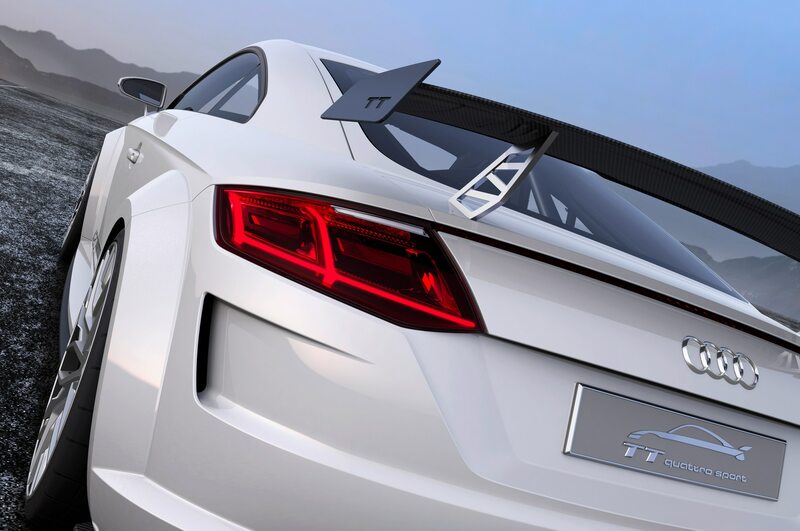 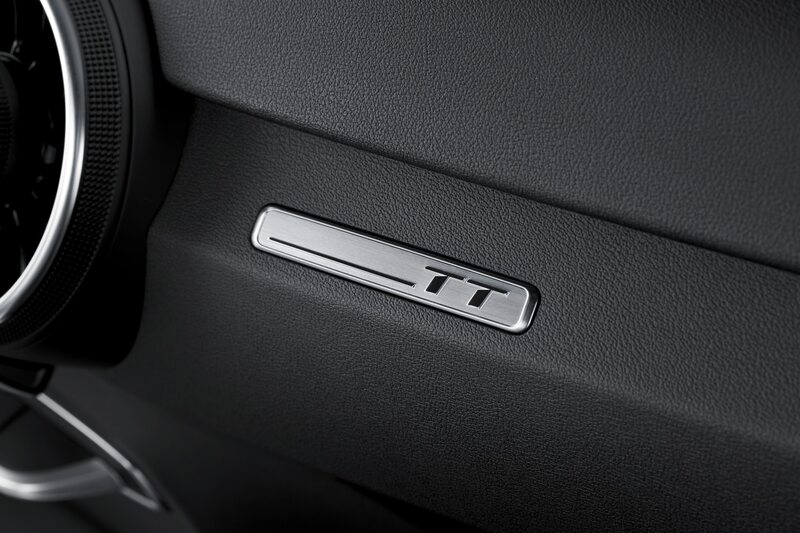 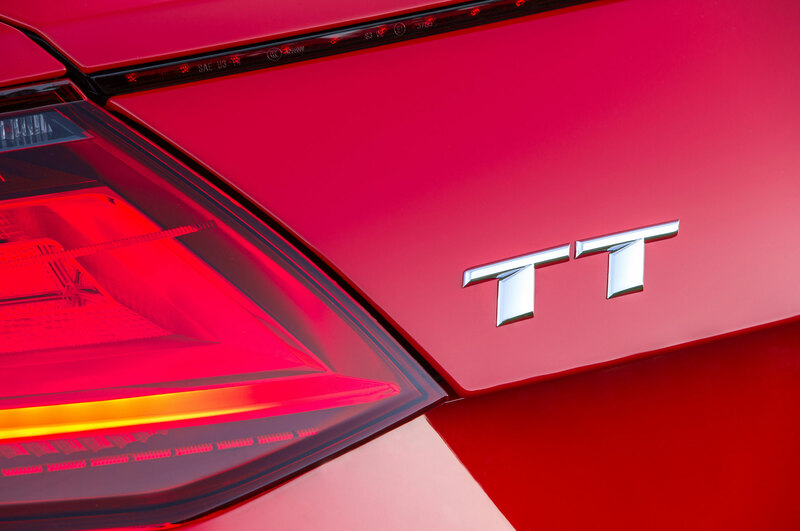 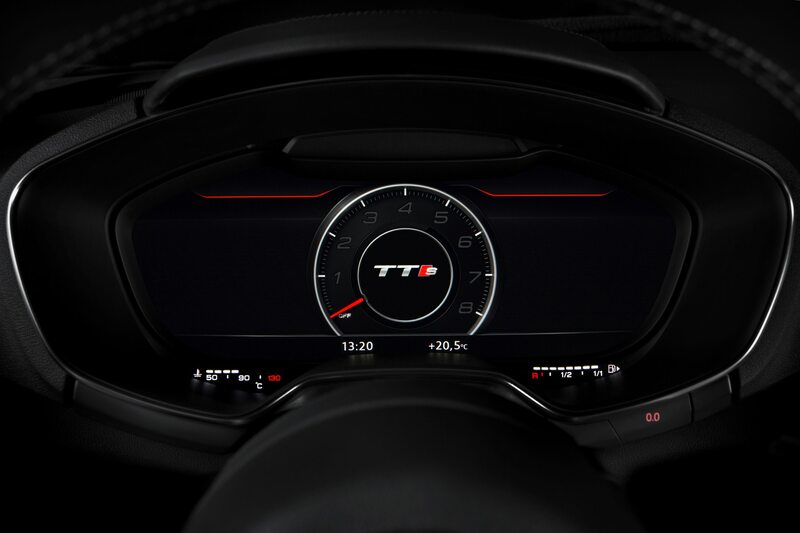 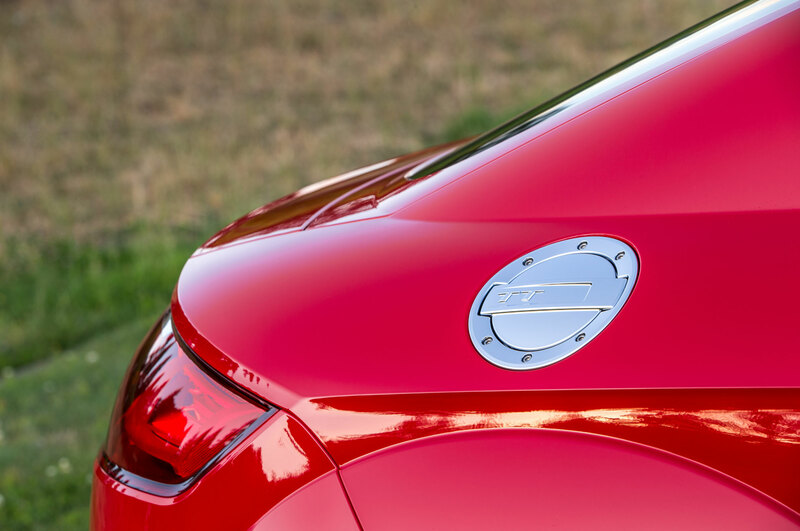 On one of their presentation slides, a TT logo subtly sidles over and gets cozy with Audi’s emerging R sub-brand. 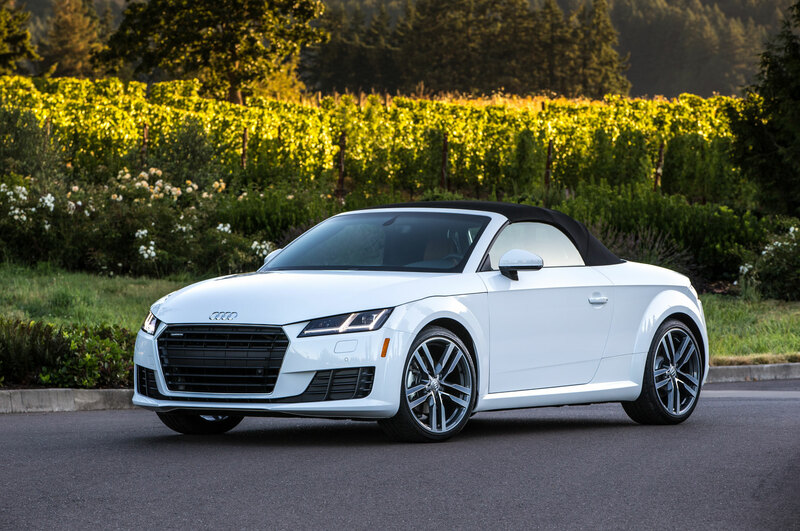 The term “baby R8” was bandied about. 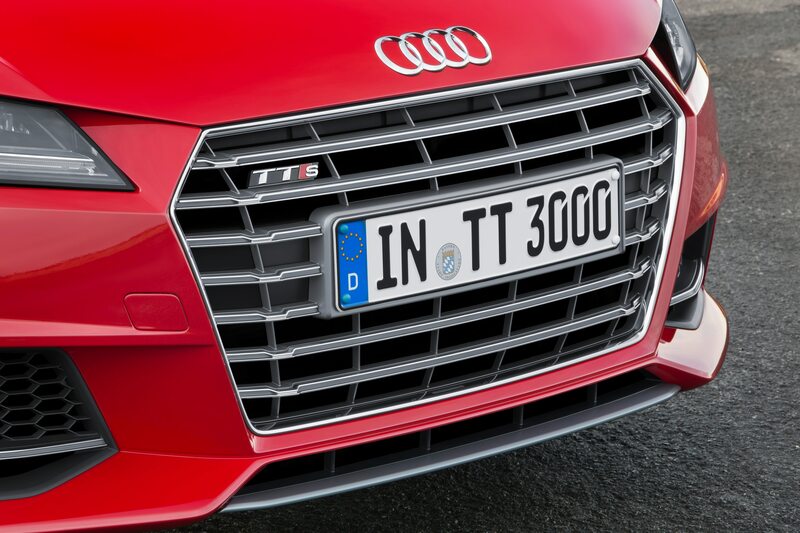 TT chief exterior designer Dany Garand made a point to accentuate the TT’s ties with the R8, like its LED lighting and its honking, upright singleframe grille. 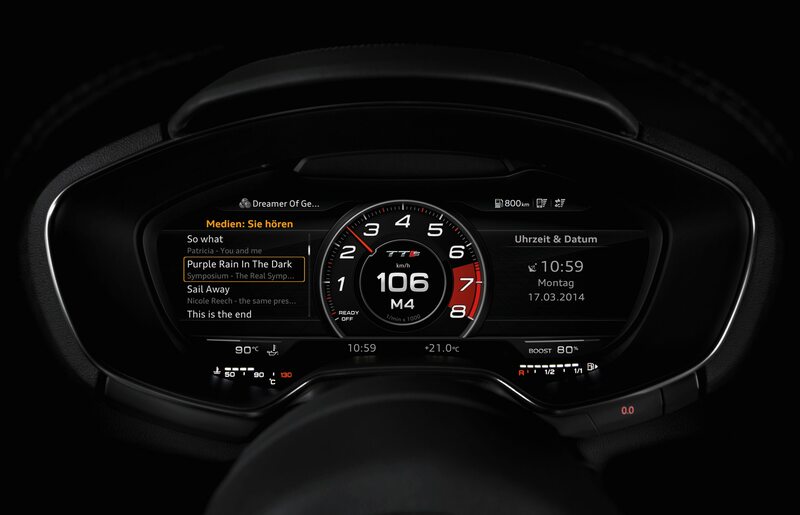 And, gasp, even the P word was mentioned: Porsche. 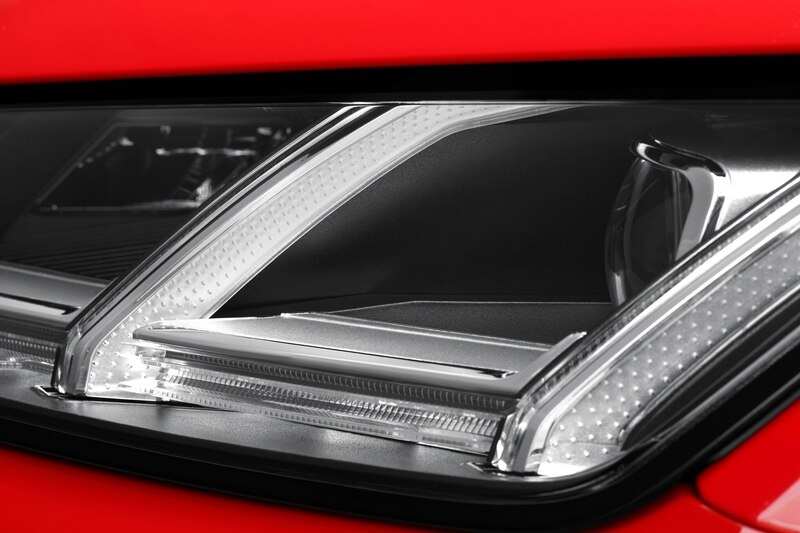 Cayman and Boxster are now squarely in the crosshairs. 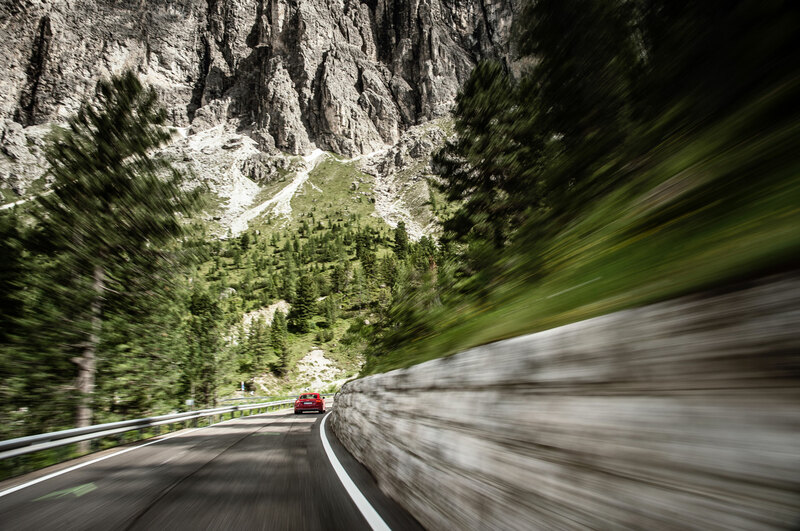 “When you hit a curve, don’t back off. 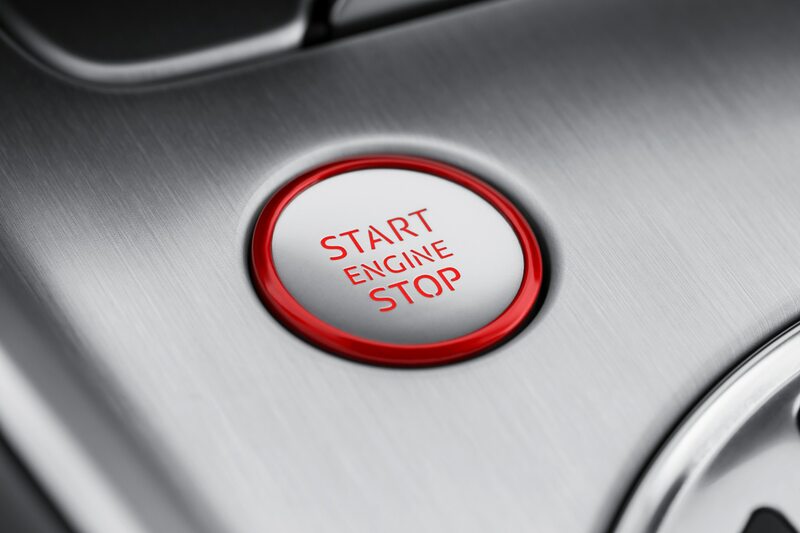 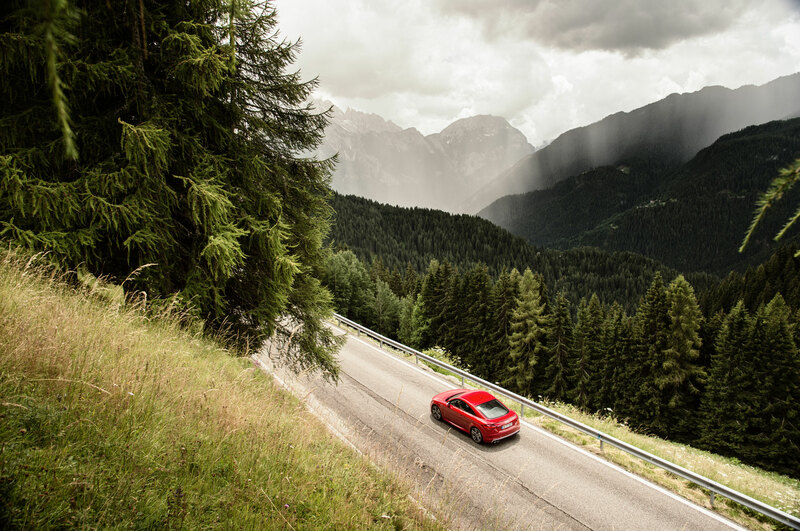 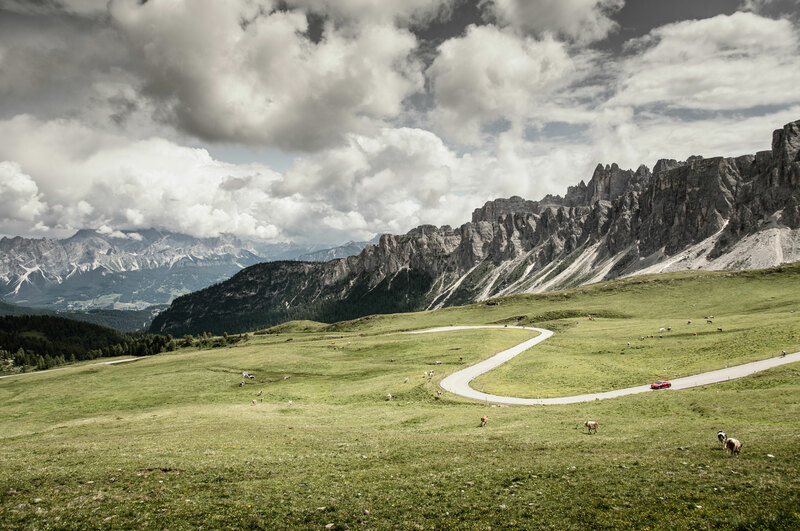 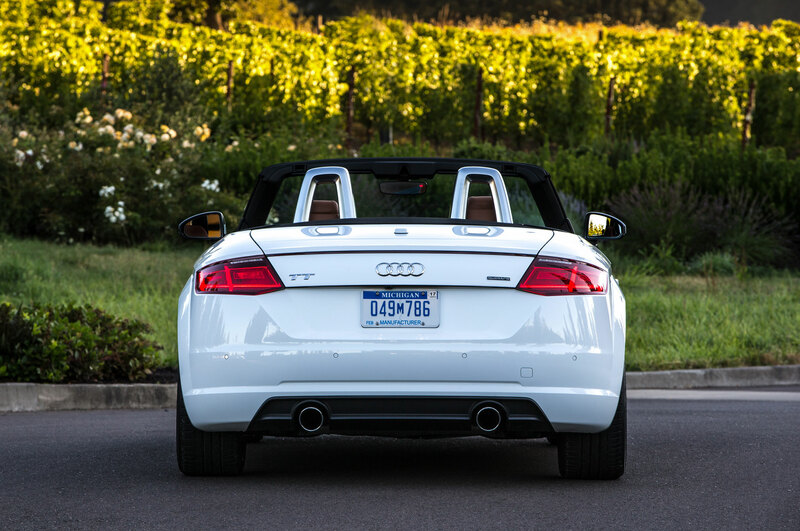 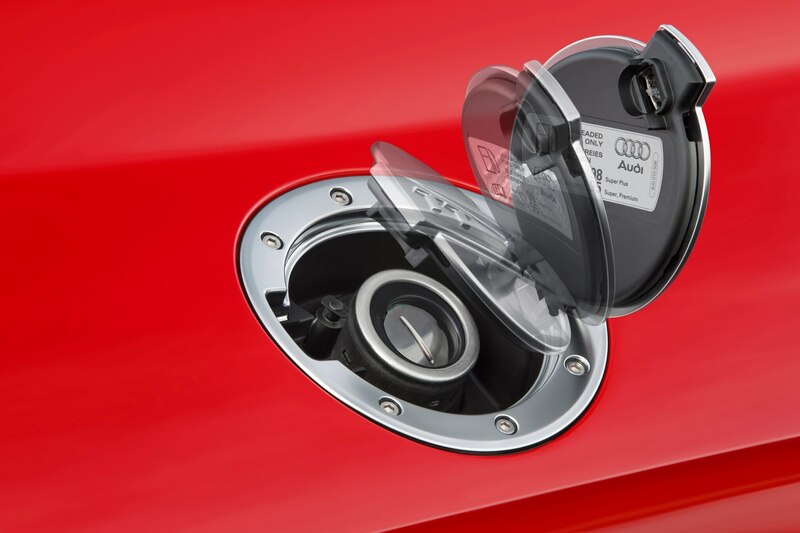 Keep your foot in it, and let the car pull you around,” Audi product planner Anthony Garbis advises us. 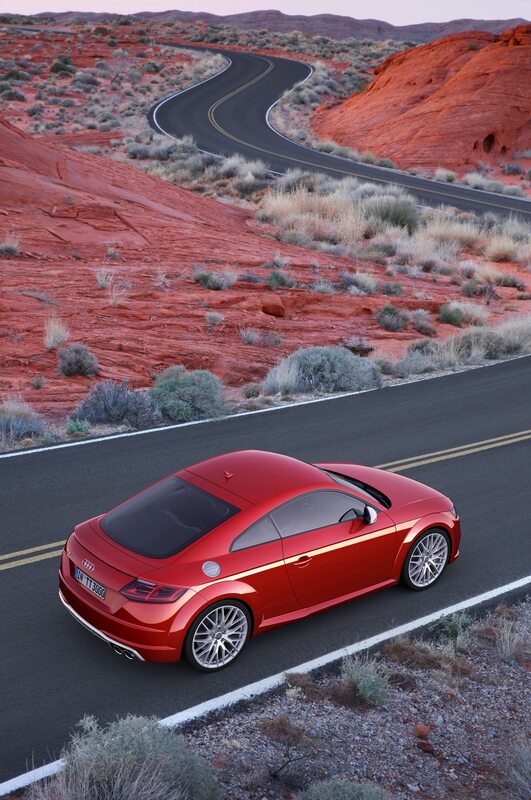 We can do that, Anthony. 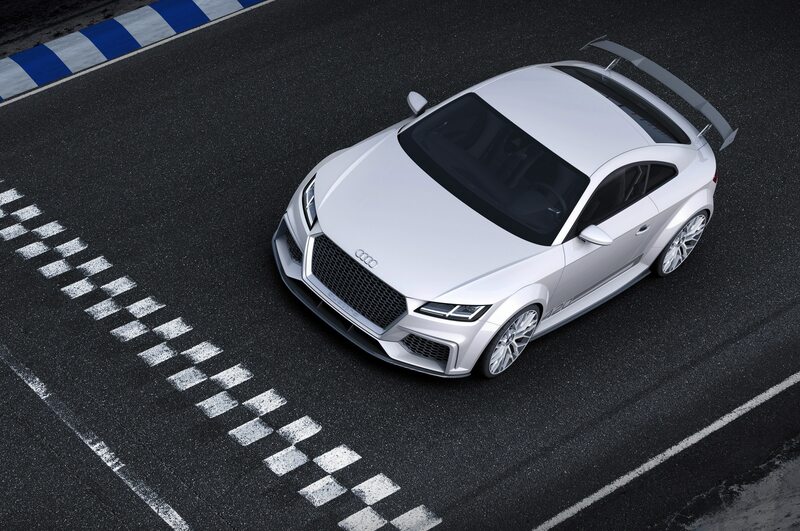 Garbis is especially confident in the TT’s version of Quattro. 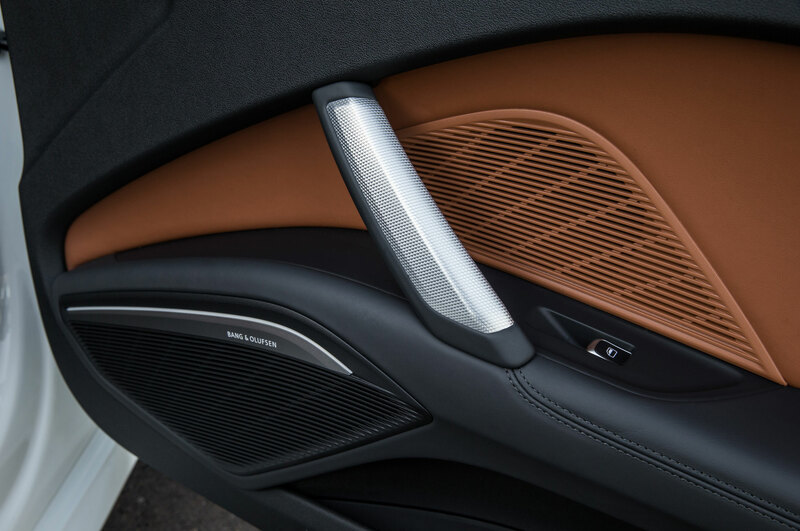 The system can deliver up to 100 percent of power fore or aft depending upon the situation, and it can send torque to an individual wheel when the system’s incessant calculating deems it necessary. 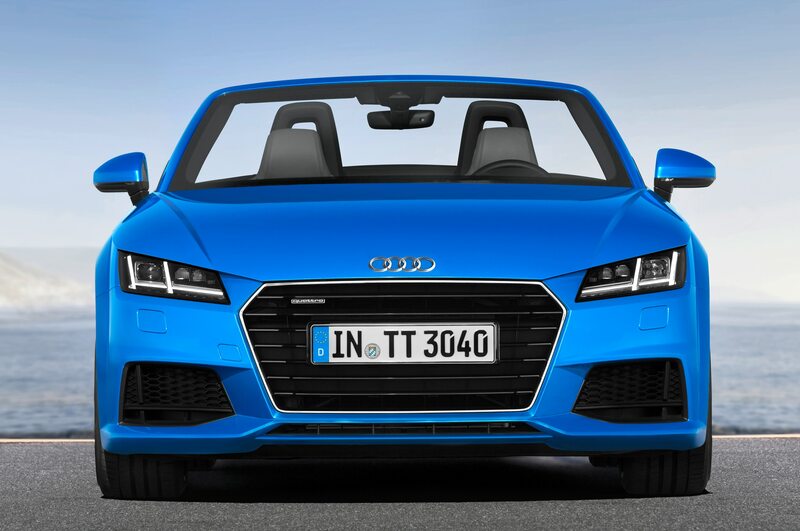 It’s all with an eye toward making the TT a more neutral and even rear-biased handler. 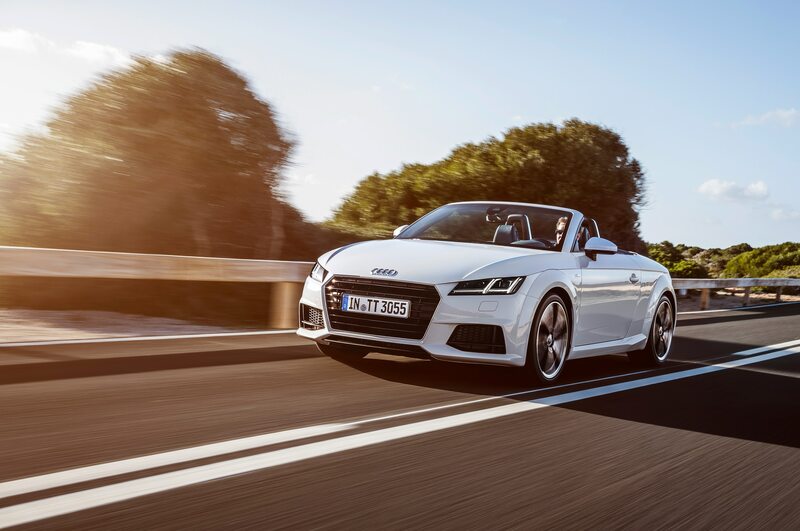 Like many of today’s Audis, the TT also allows for multiple adjustments to various vehicle settings via Audi drive select, including steering effort, shift points, suspension stiffness, and even engine note, by manipulating its Comfort, Sport, Dynamic, and Individual settings. We let Comfort take over during long freeway stretches. 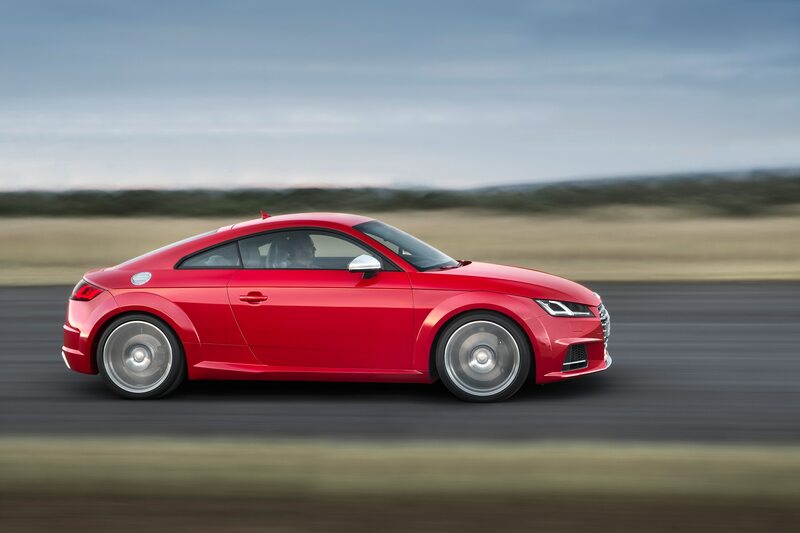 You can feel the steering effort loosen as the RPMs lower for higher miles per gallons. 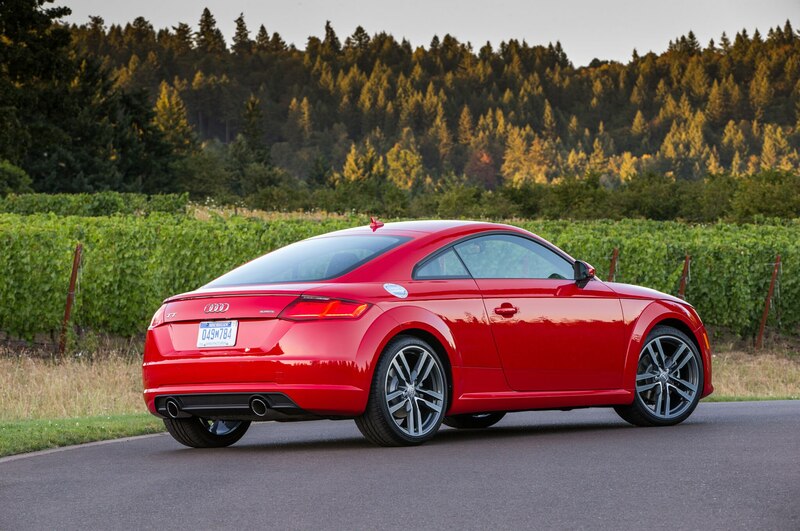 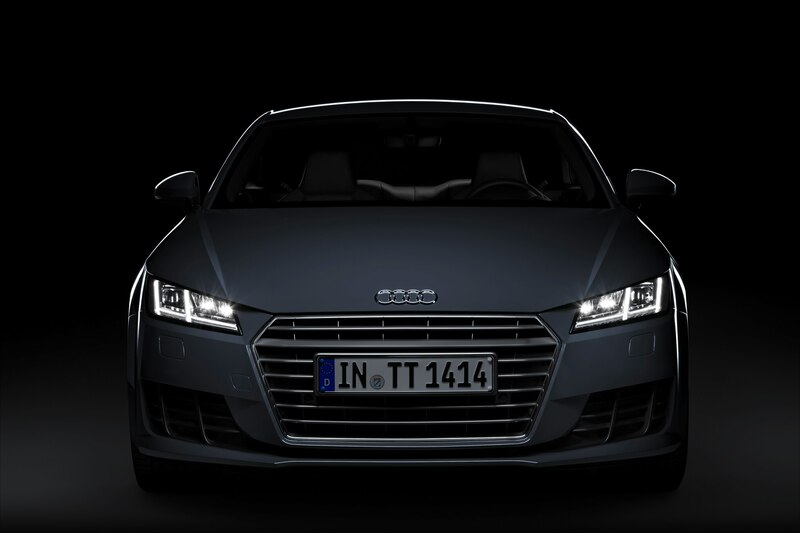 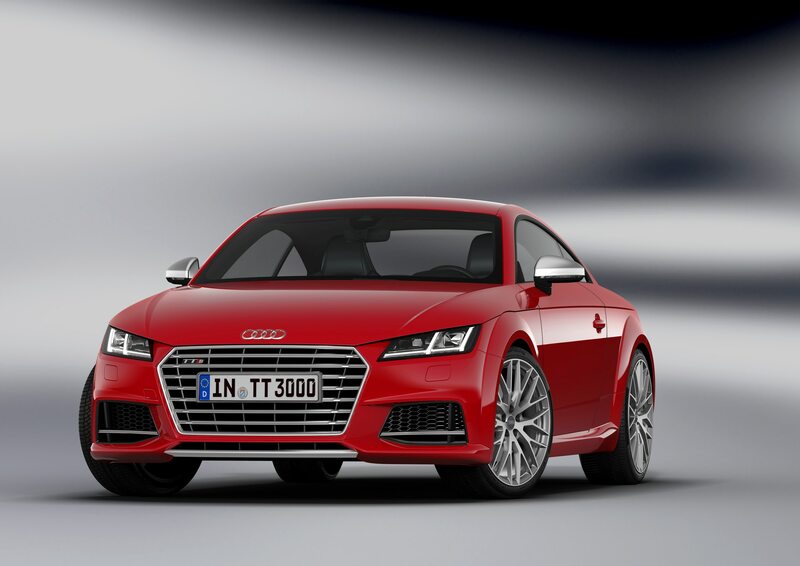 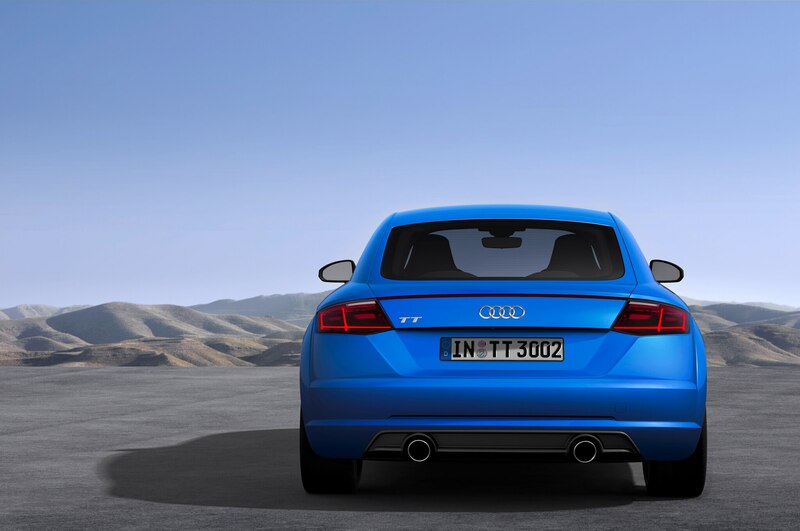 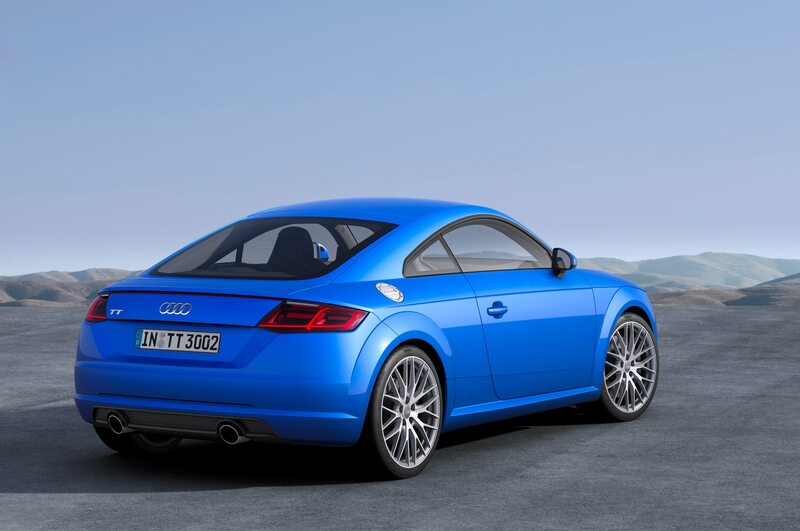 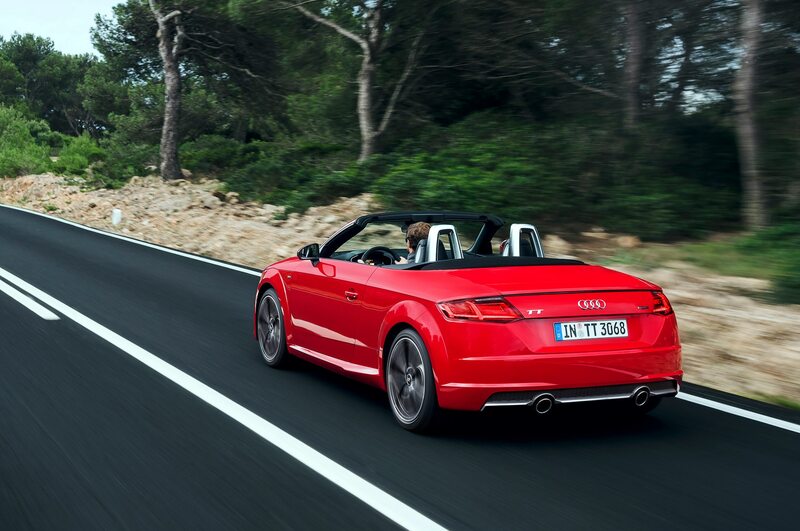 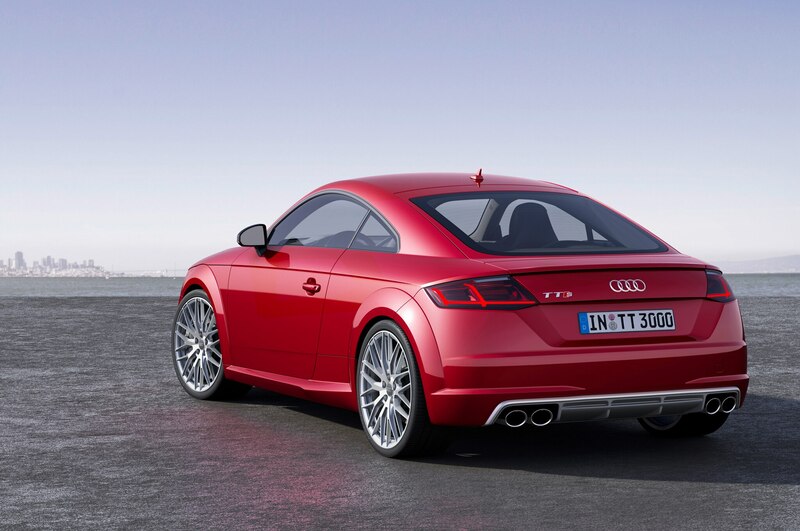 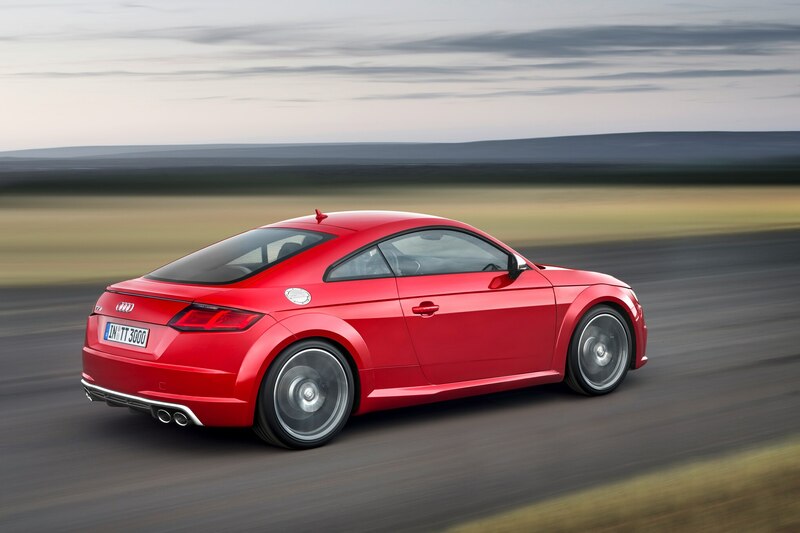 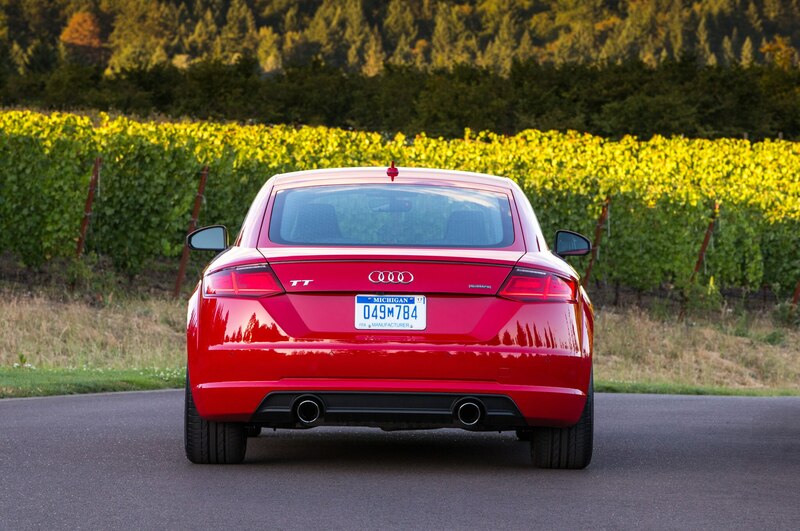 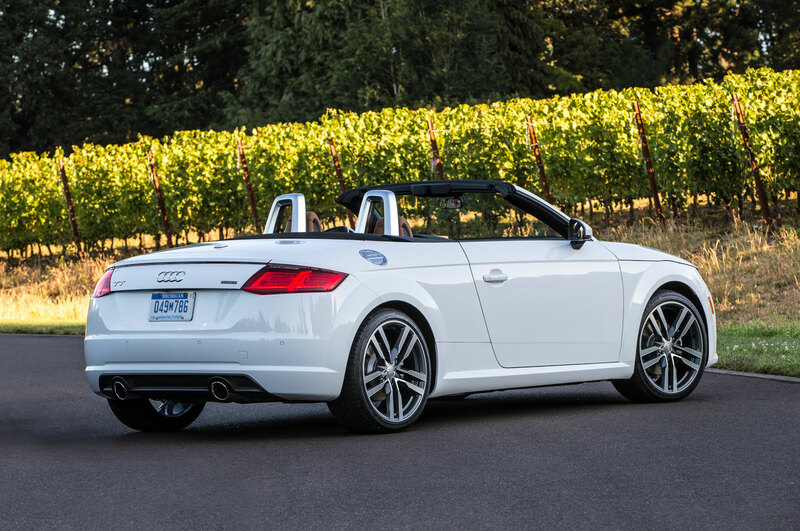 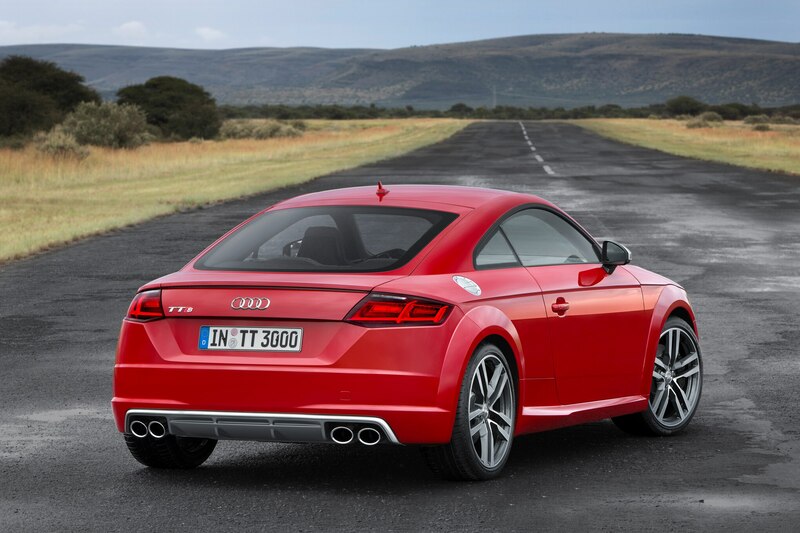 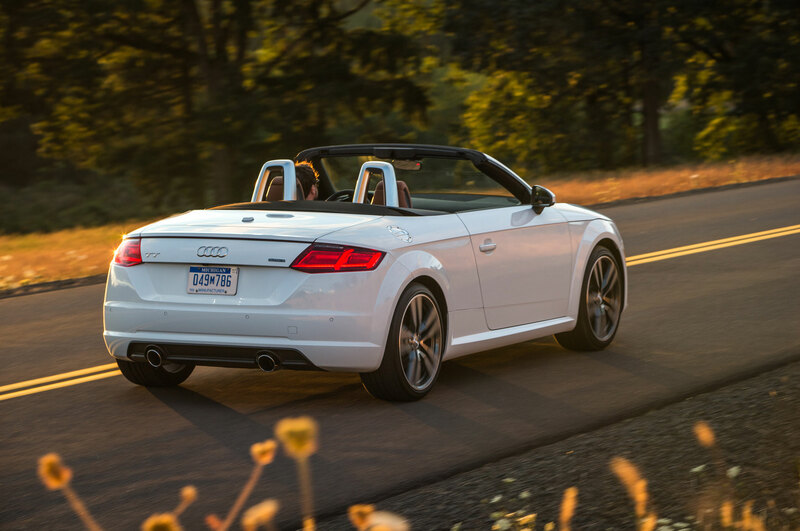 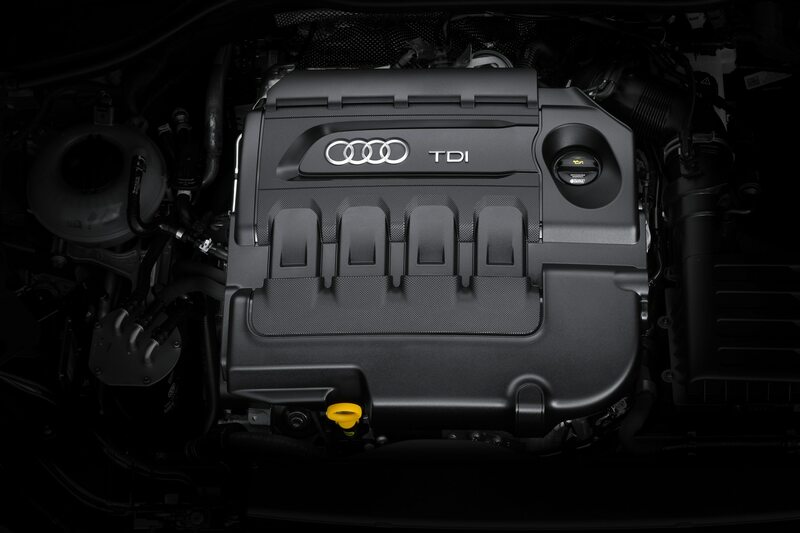 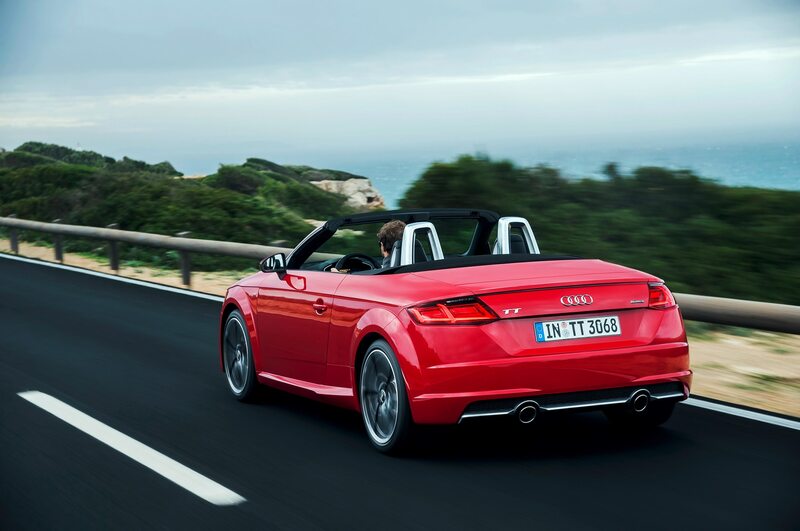 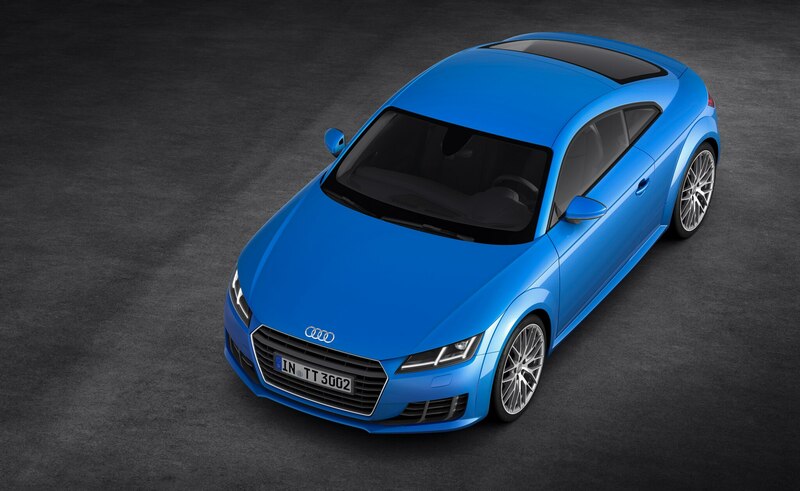 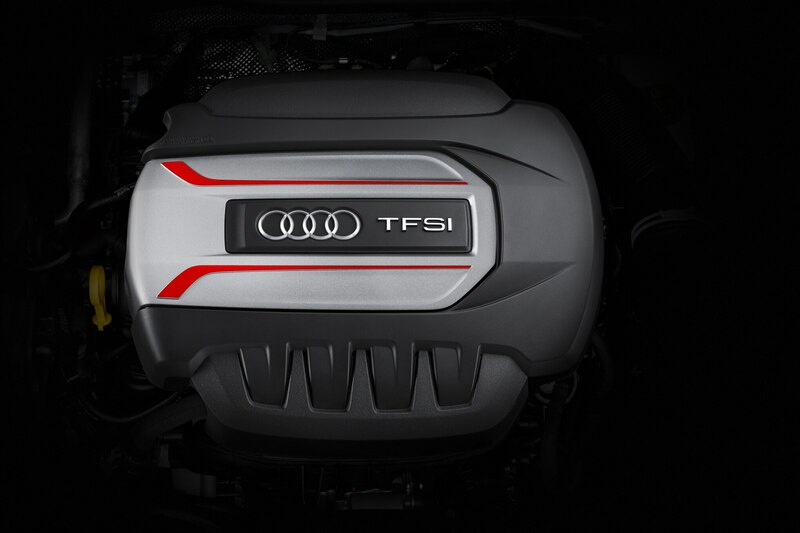 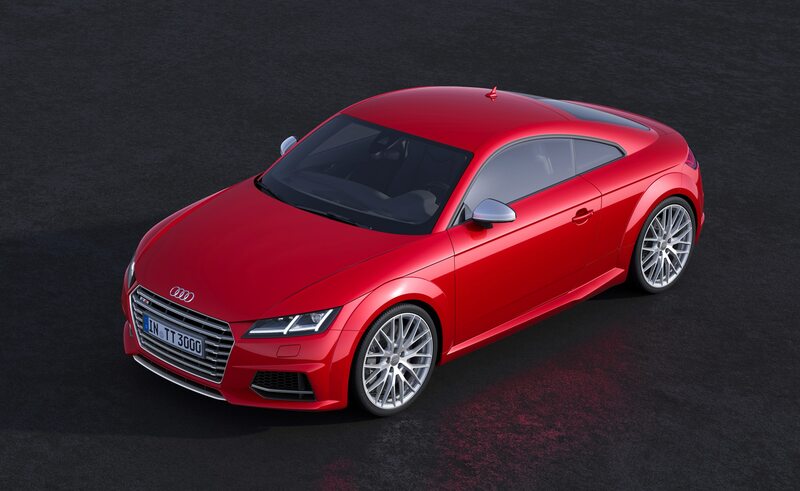 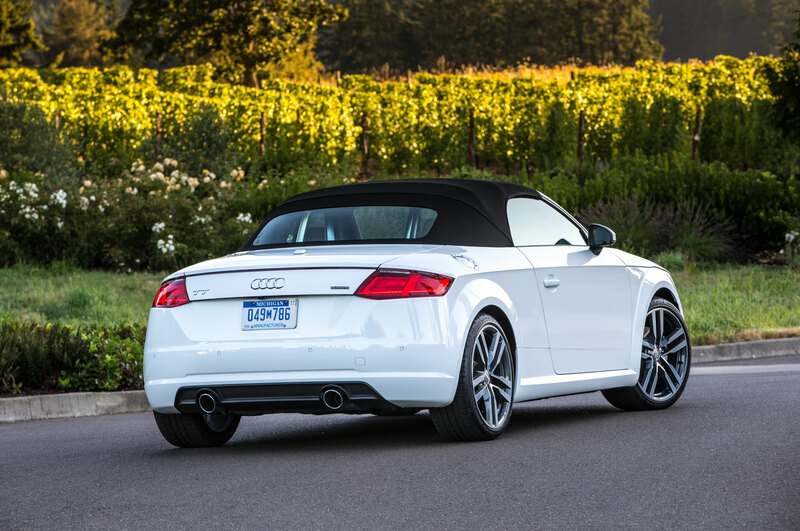 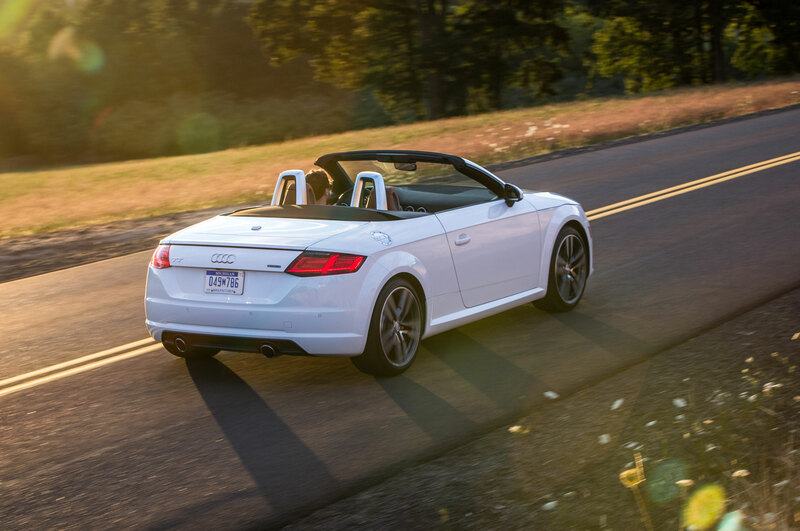 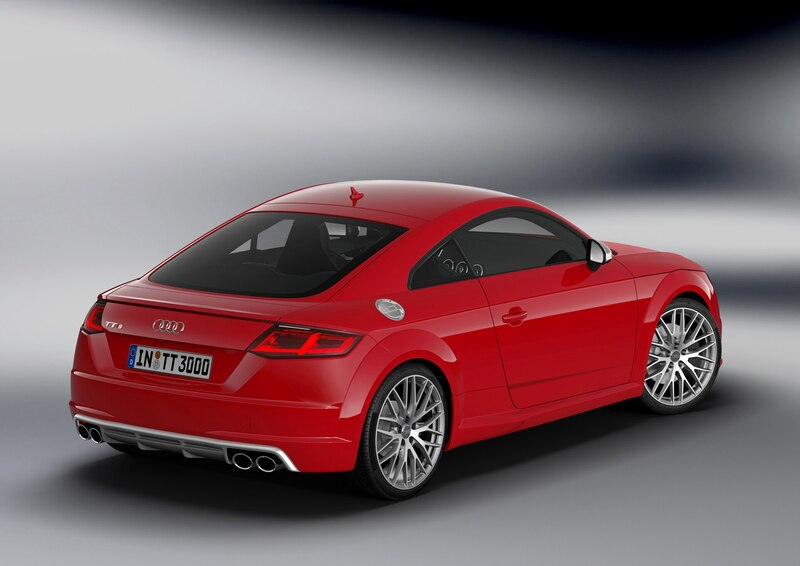 Dial up Dynamic and the TT tightens up; the 2.0-liter turbo four holds revs longer and shifts later. 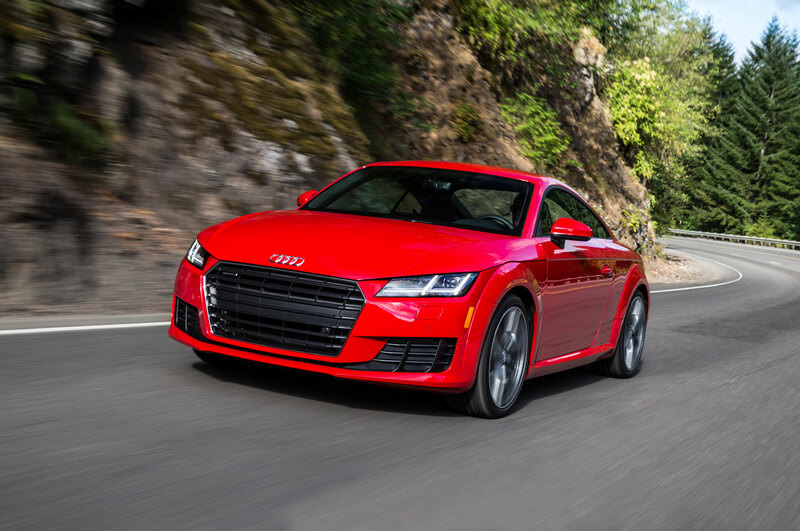 VW’s familiar four-cylinder makes 220 horsepower and 258 lb-ft of torque in this application (292 hp and 280 lb-ft in the TTS) and is paired a six-speed Stronic dual-clutch automatic. 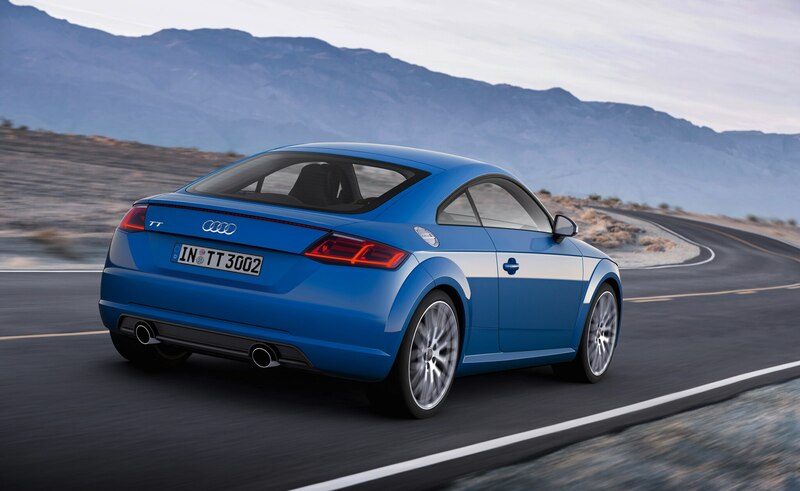 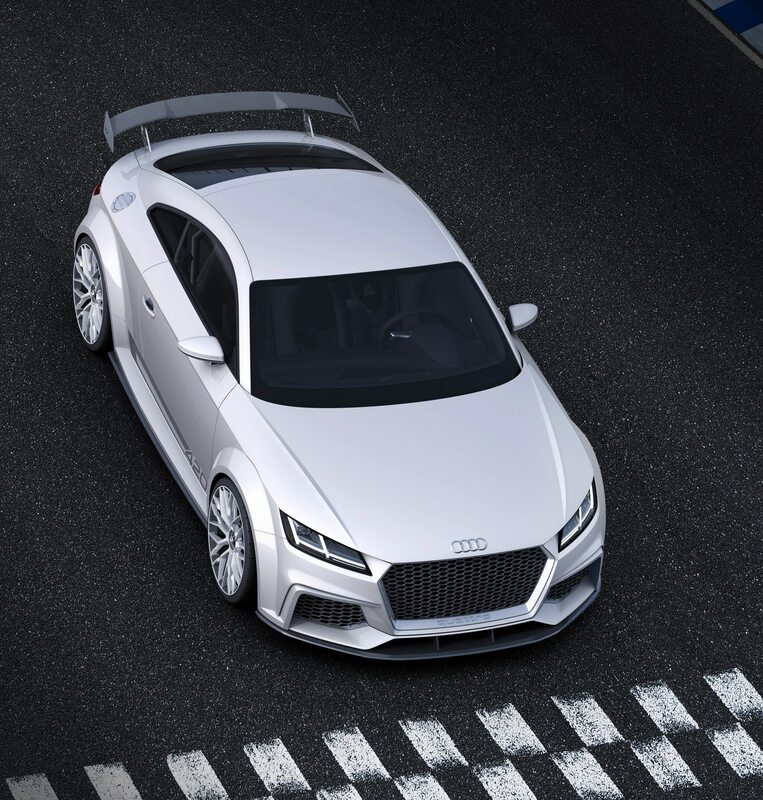 In Dynamic, the TT’s all-wheel drive system has a fixed rear-wheel bias. 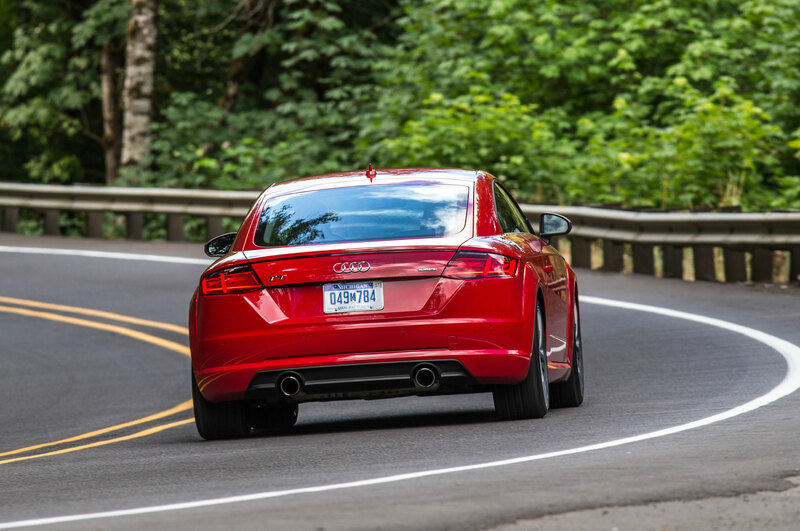 When we keep a firm foot on the gas along the majestic, pine-lined ribbons of Oregon roads, the car behaves as Garbis promised, inspiring confidence to go even harder into the next set. 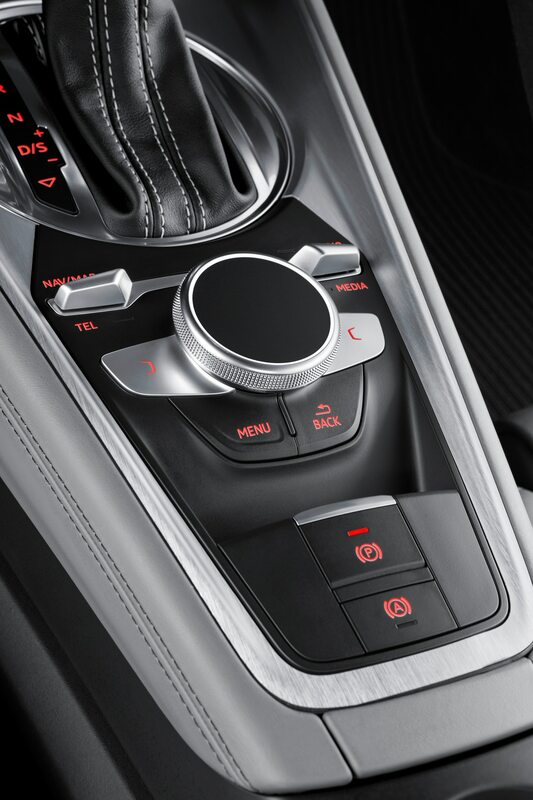 Engage manual mode and you’ll feel a bit more in control as you charge hard, brake late, and downshift into a tight, slow hairpin. 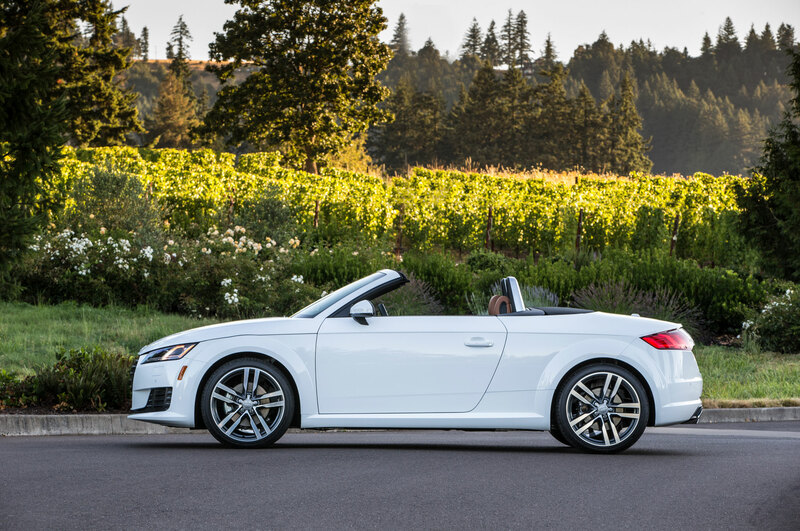 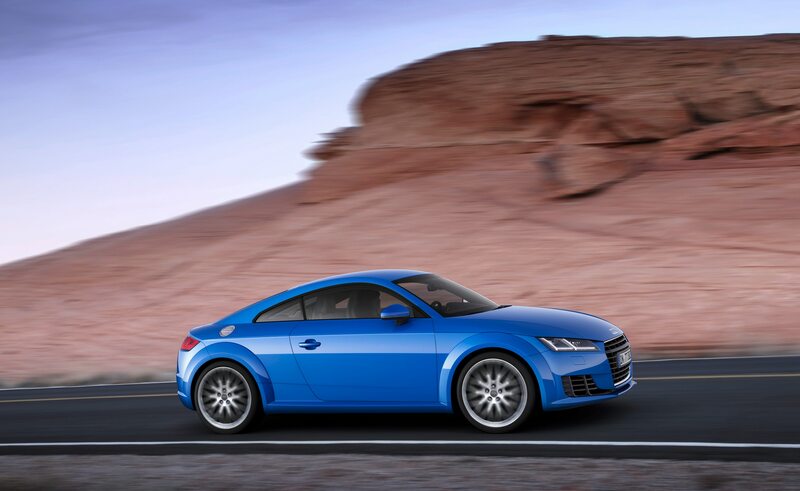 The base 2016 Audi TT is no slouch at 5.3 seconds to 60 mph for the Coupe (which matches the base Cayman) and 5.6 seconds for the roadster. 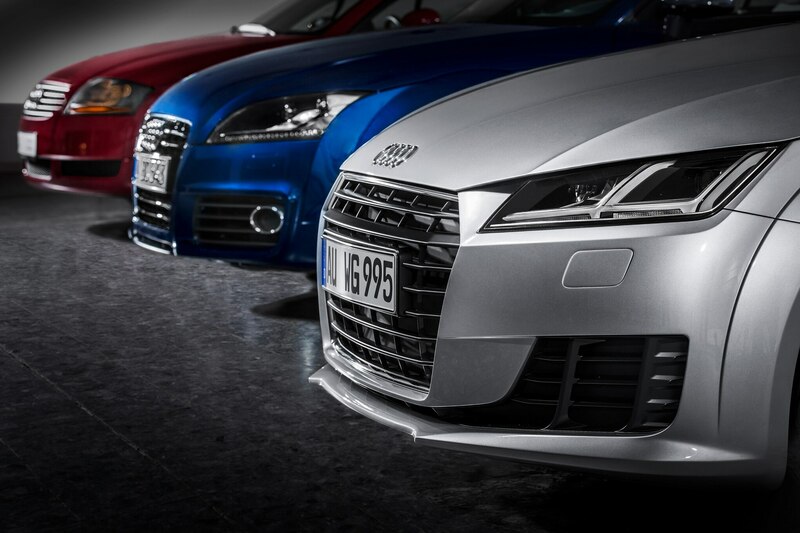 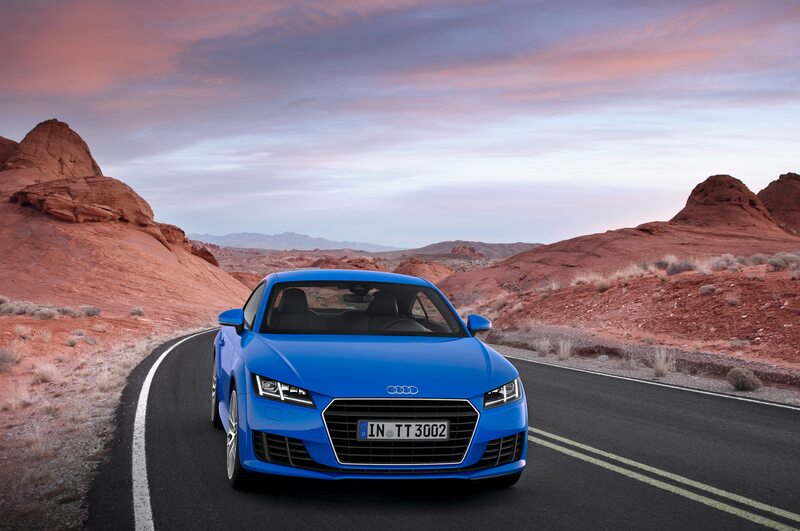 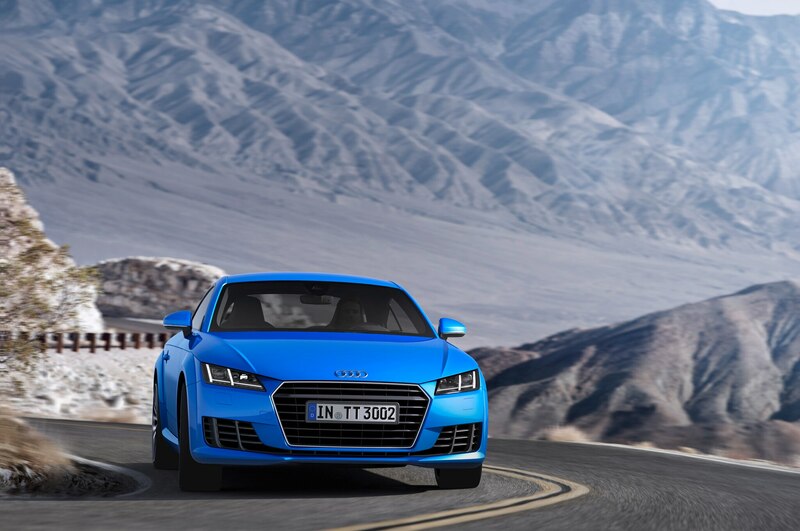 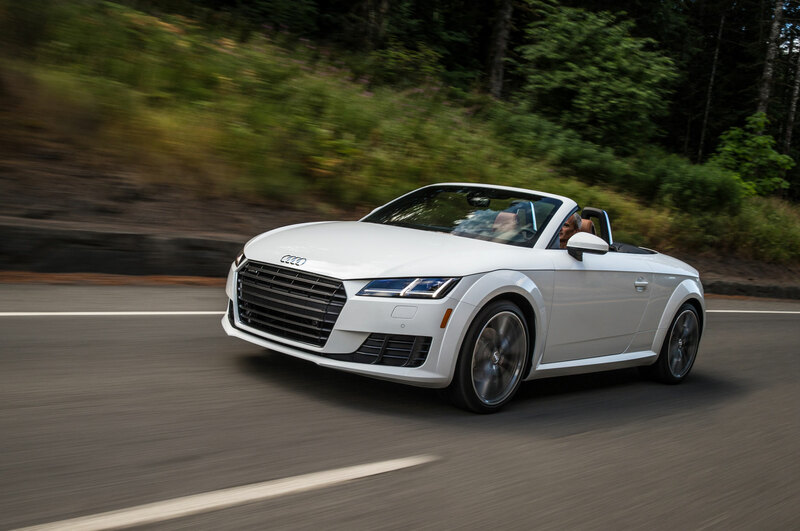 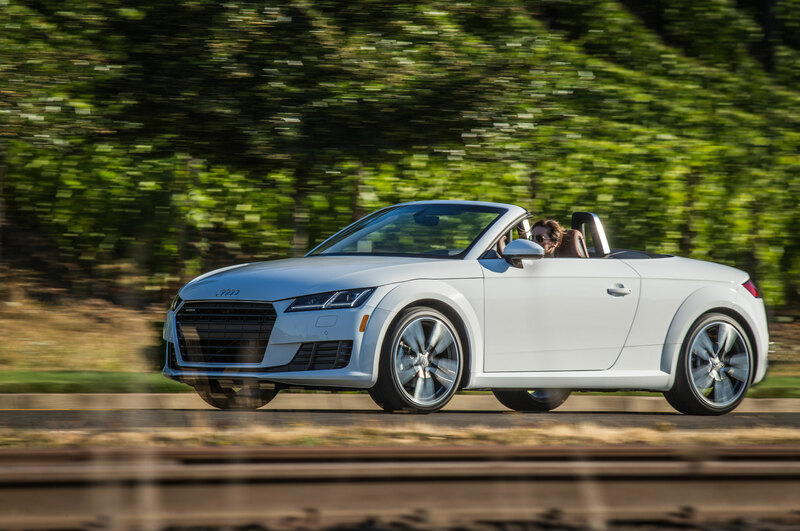 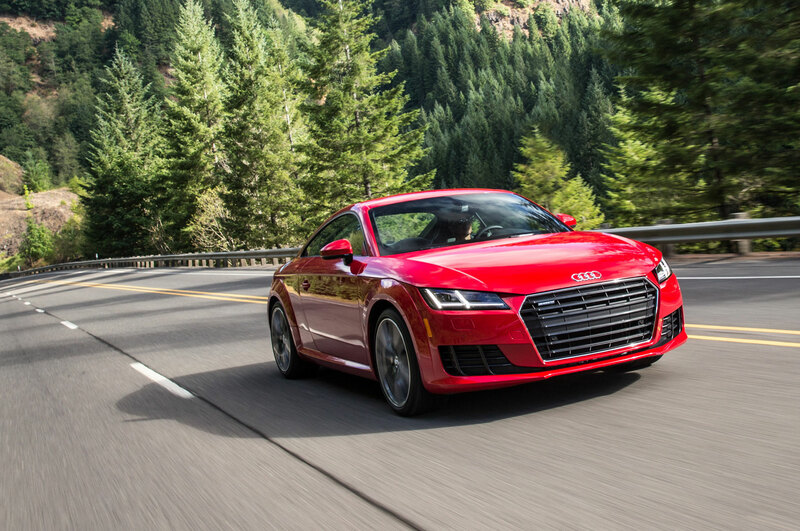 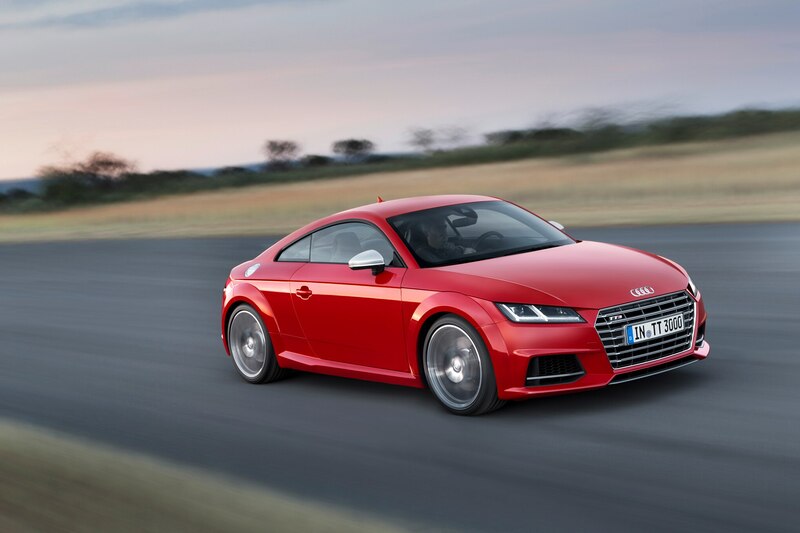 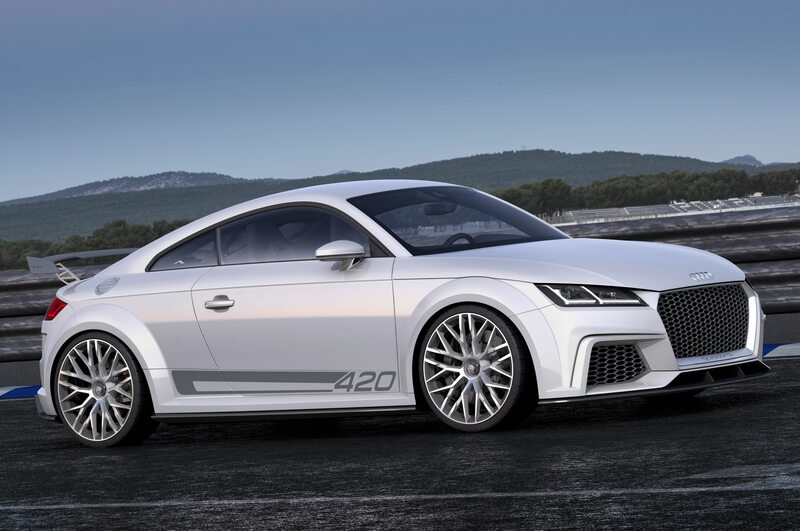 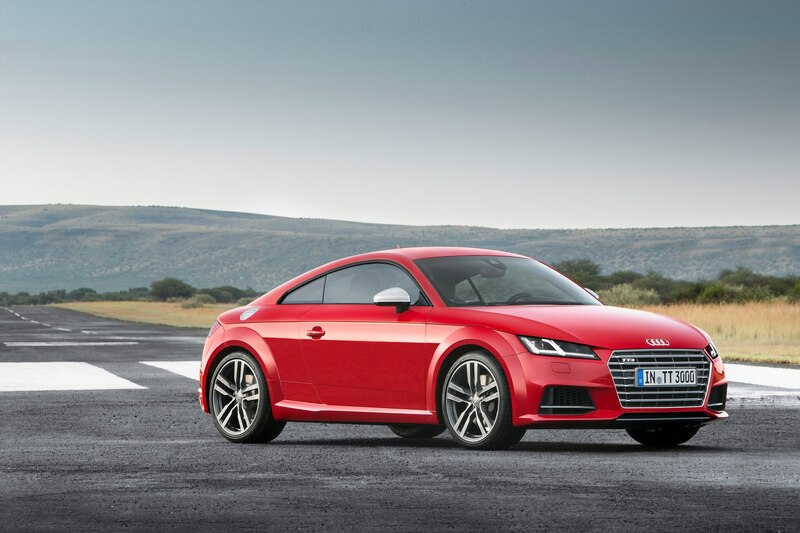 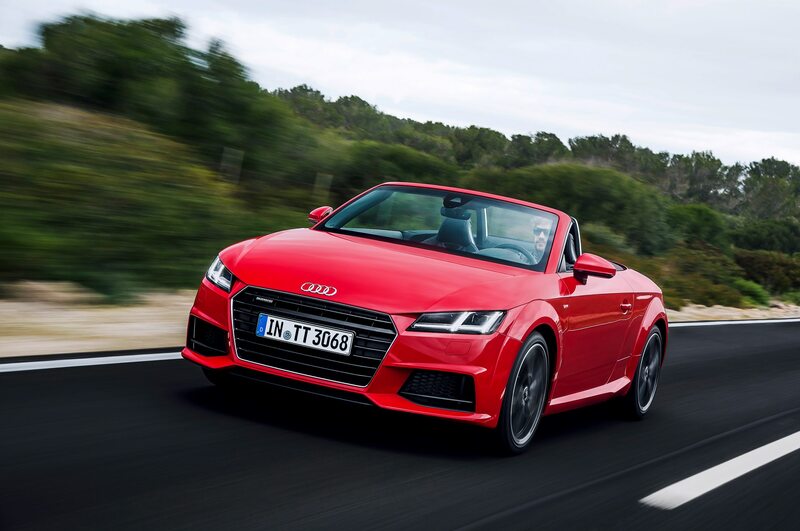 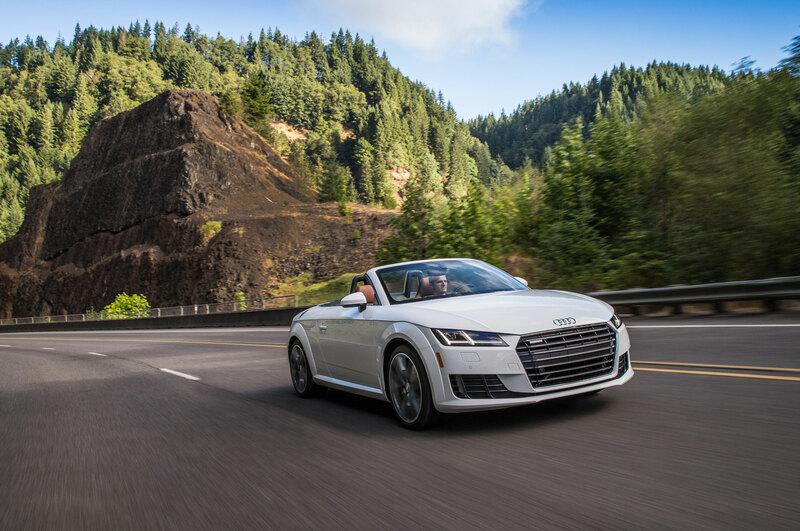 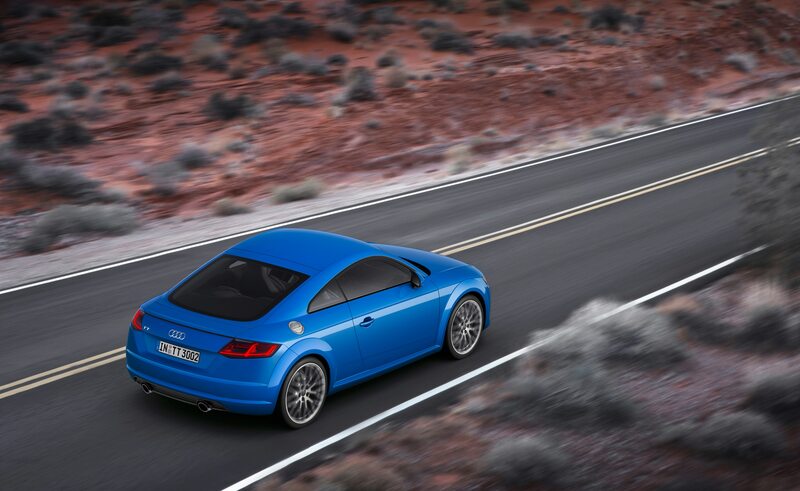 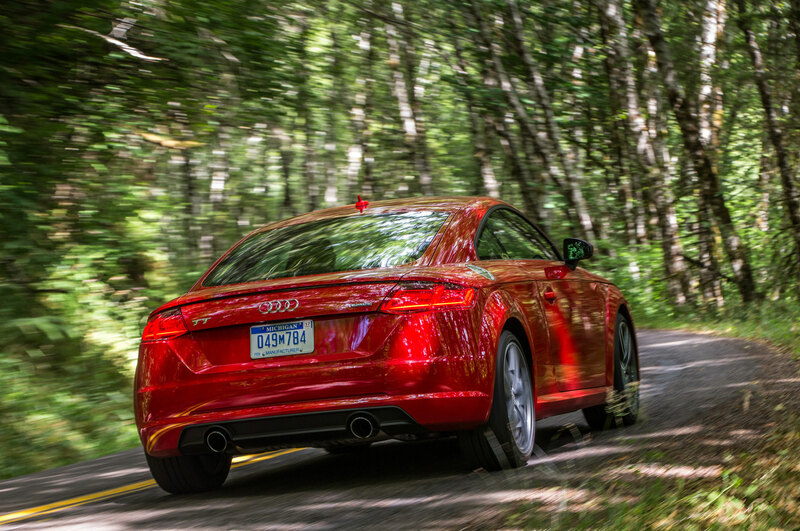 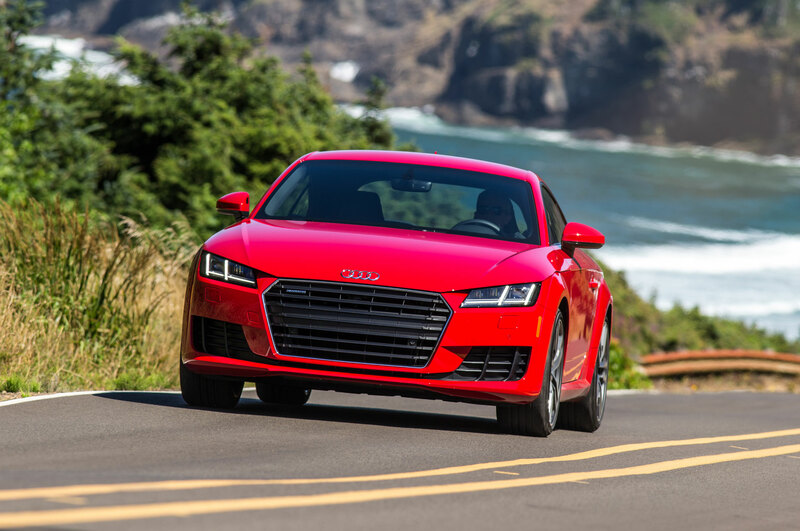 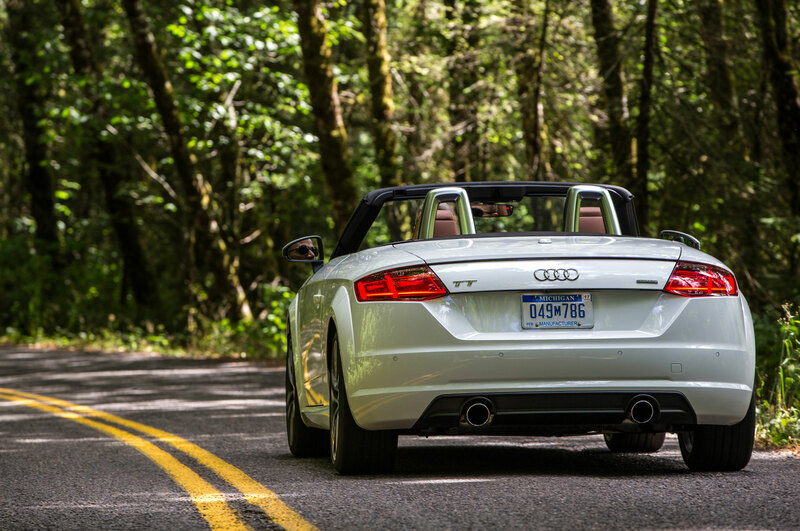 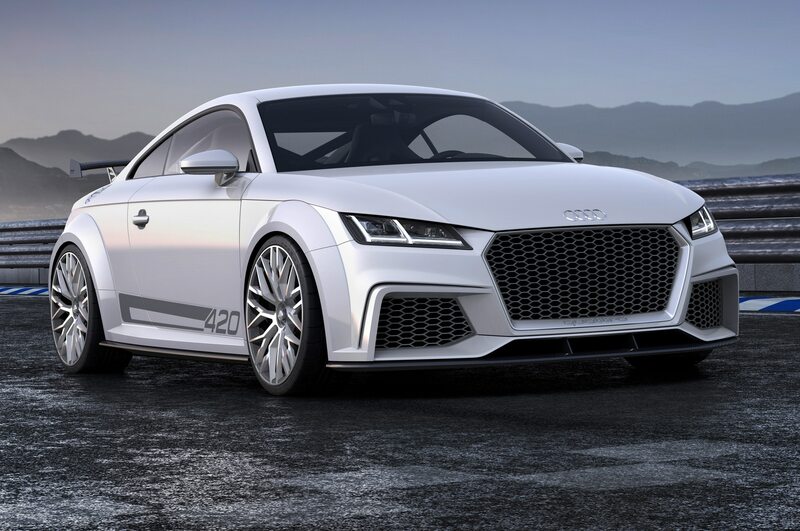 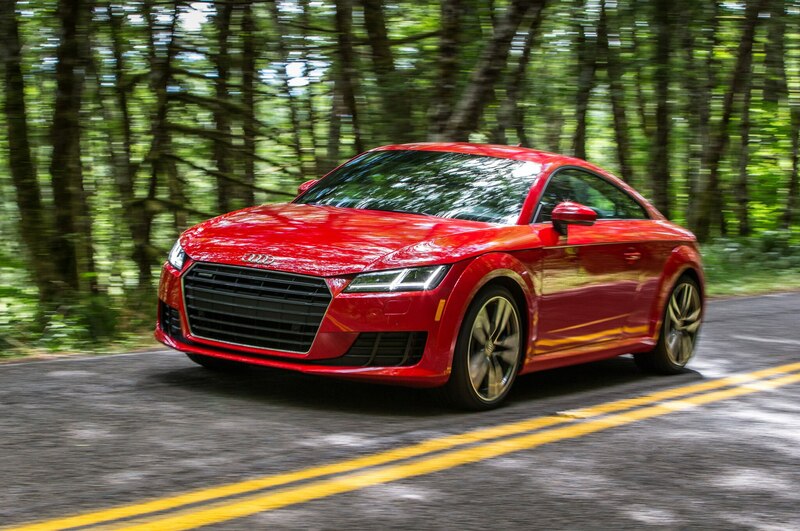 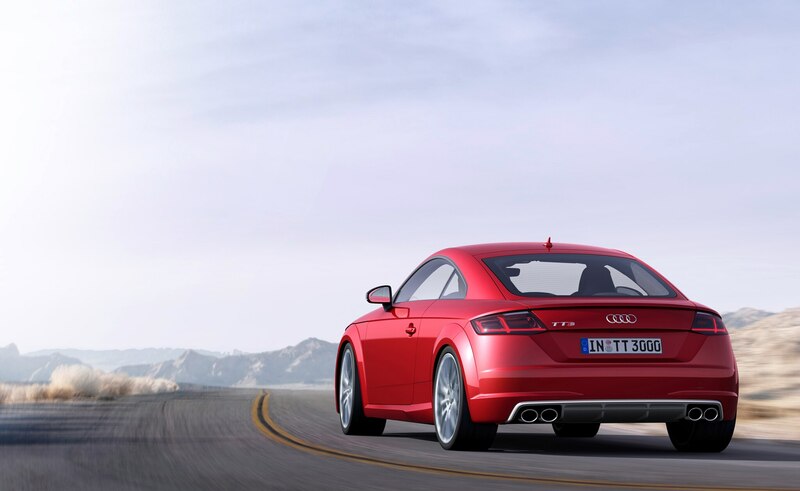 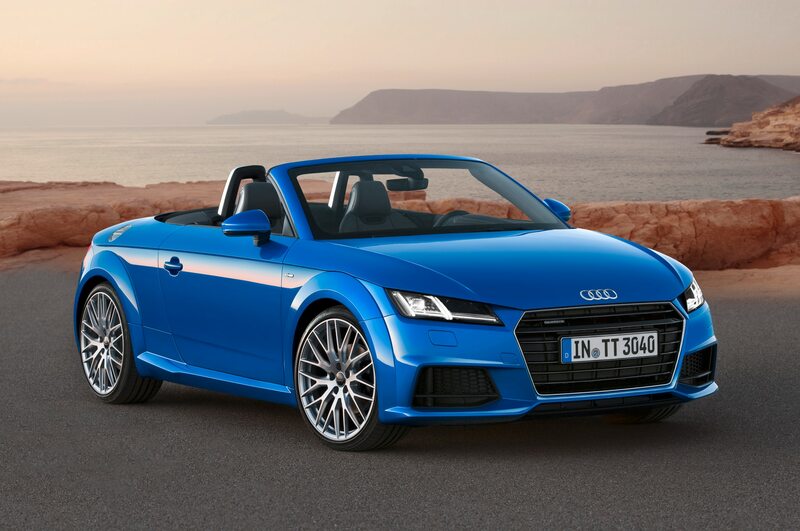 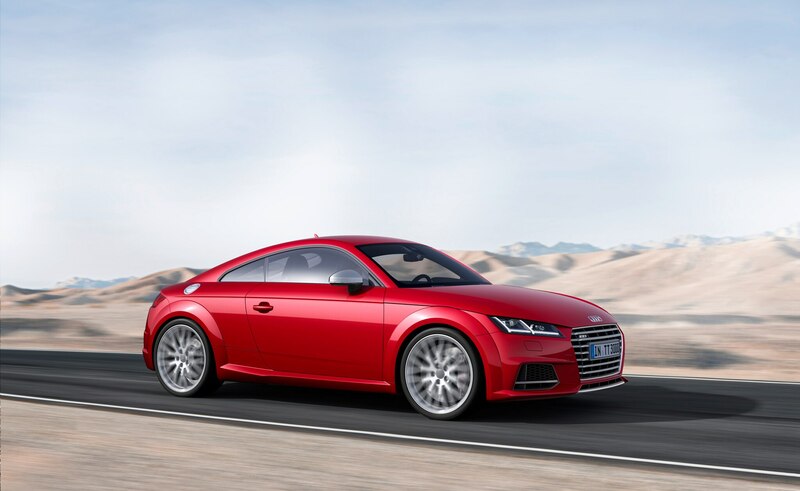 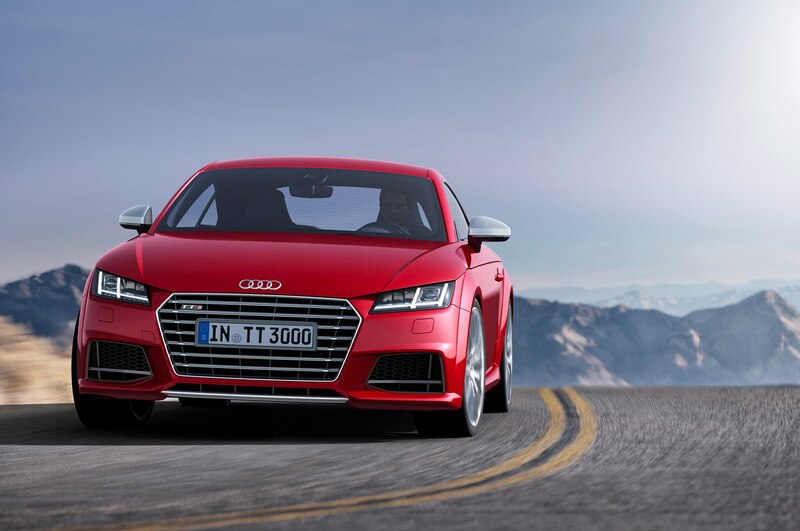 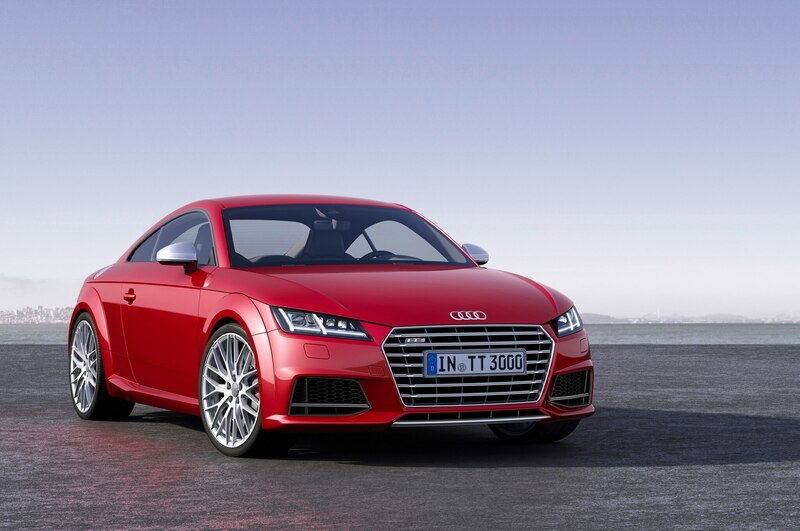 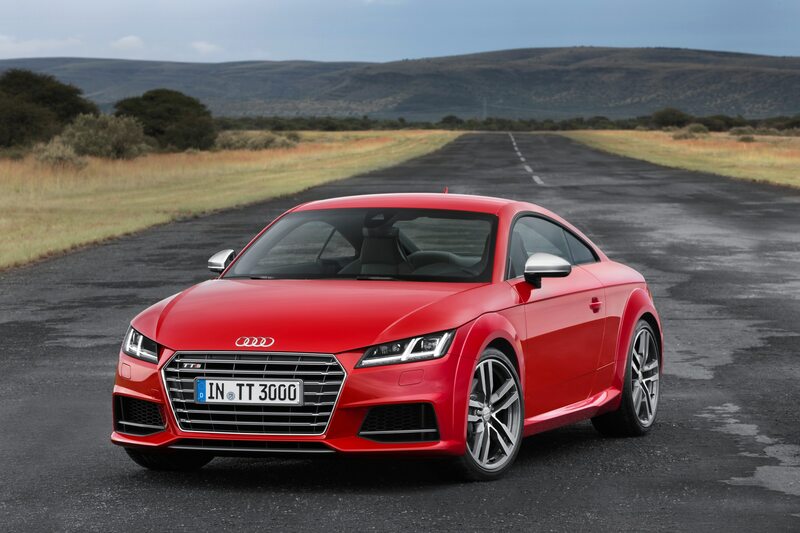 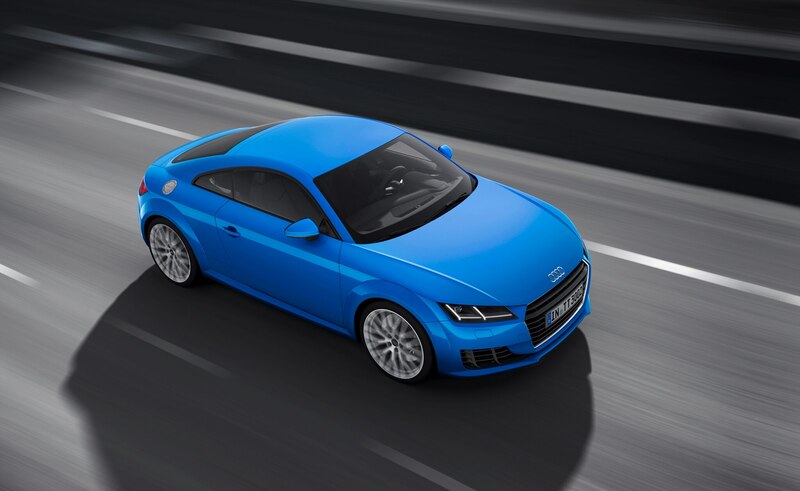 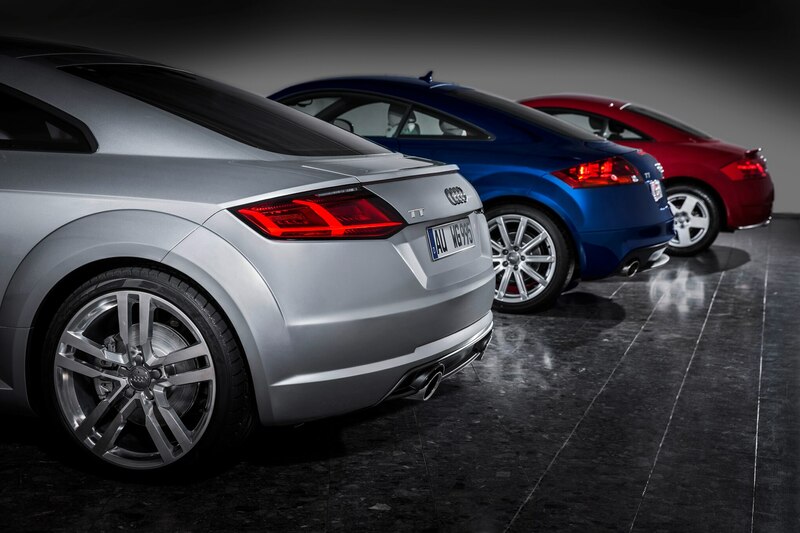 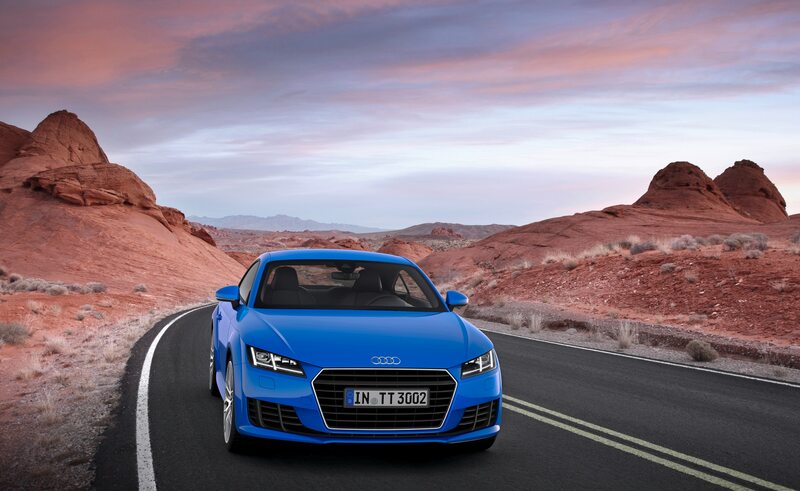 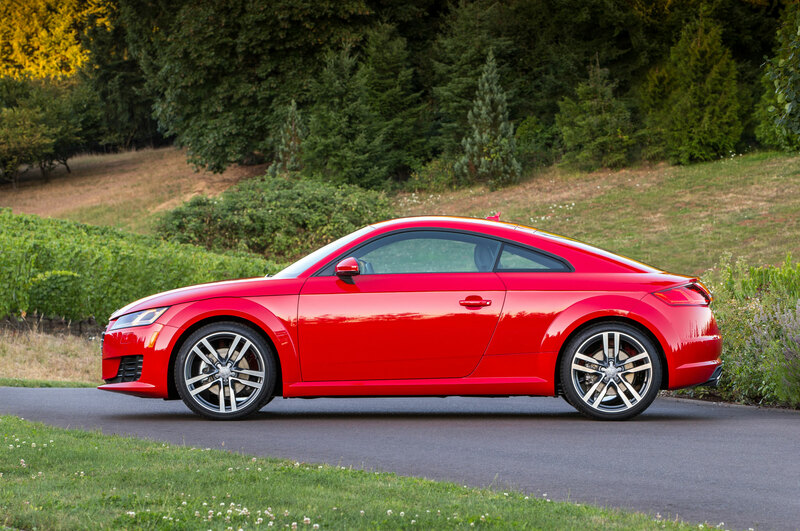 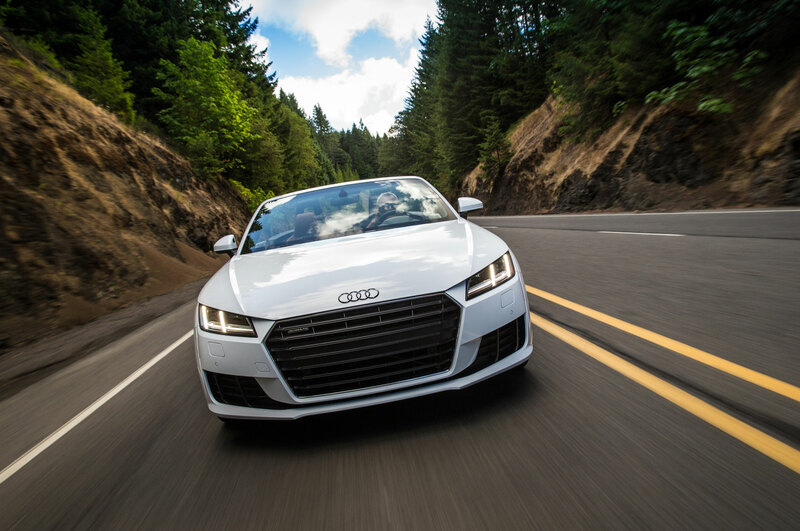 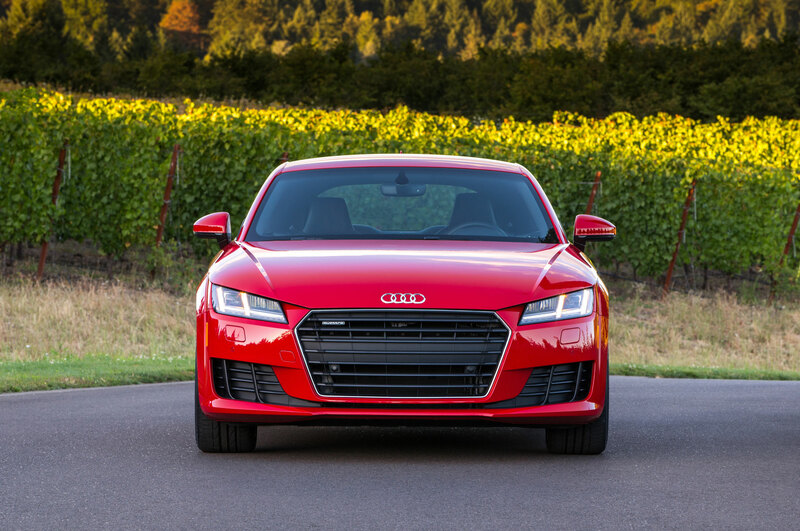 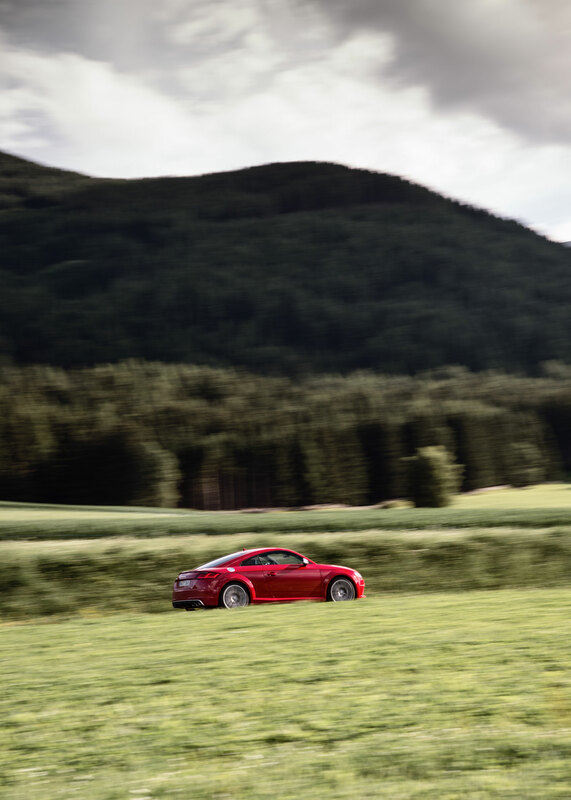 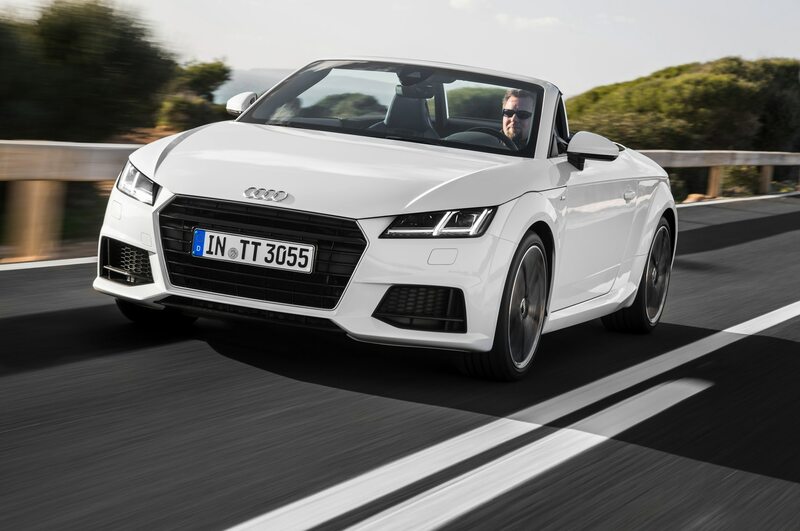 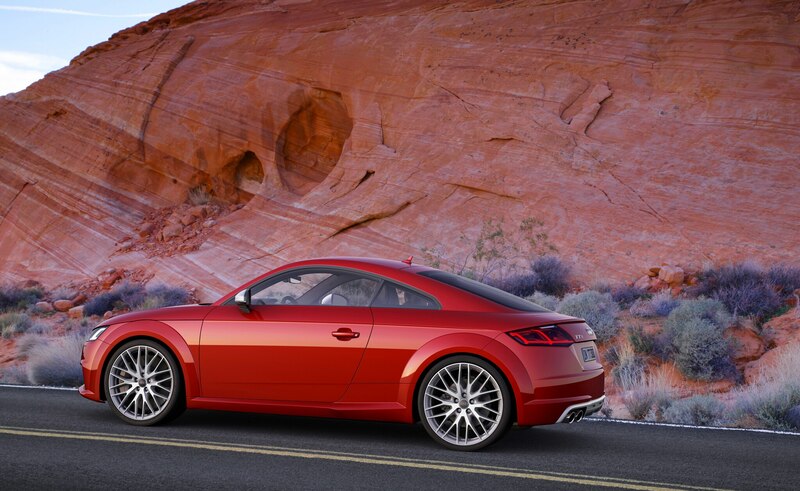 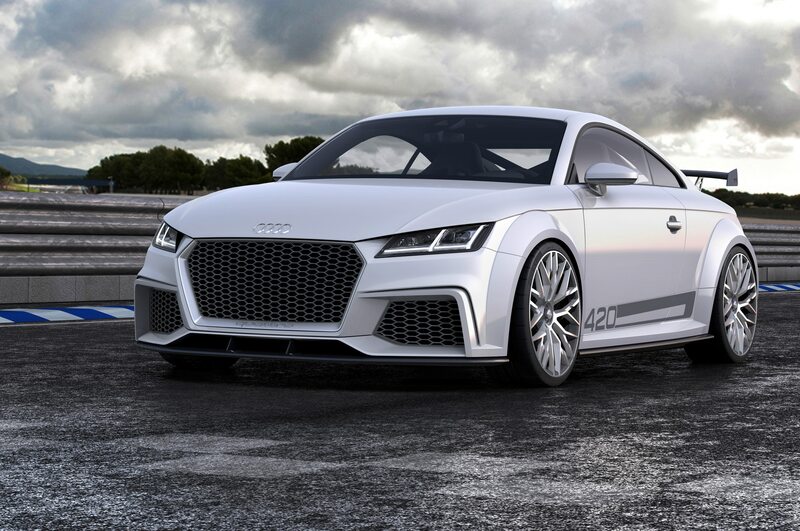 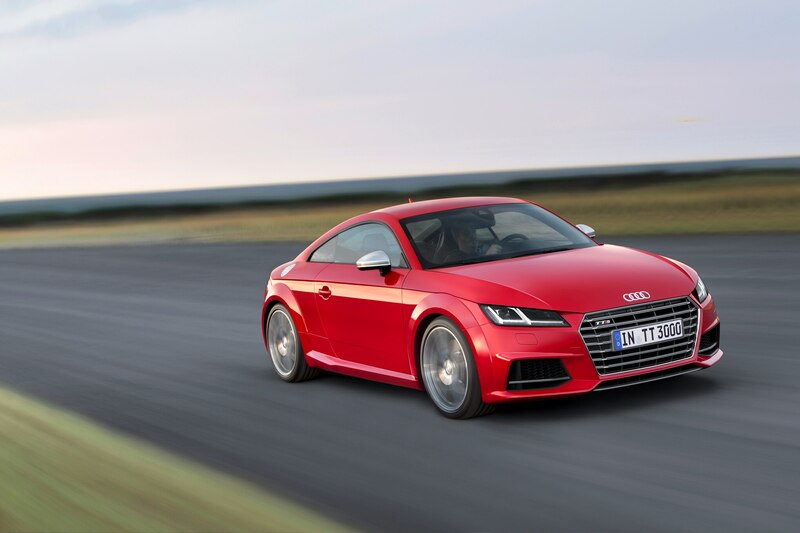 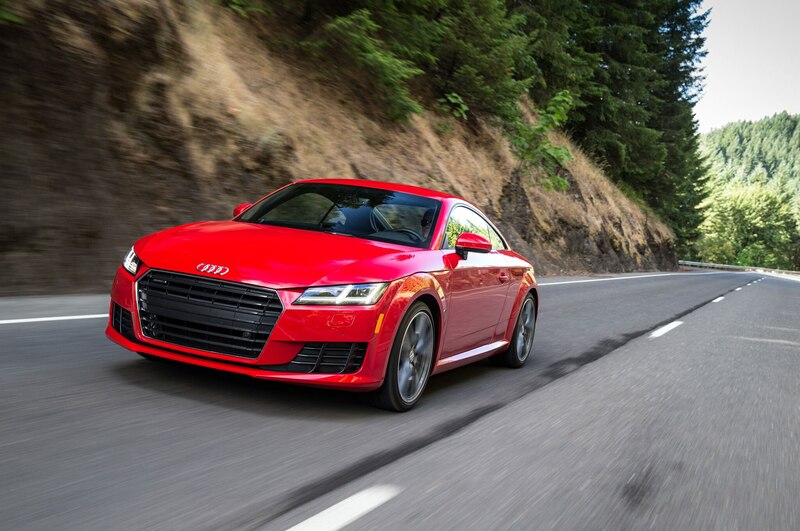 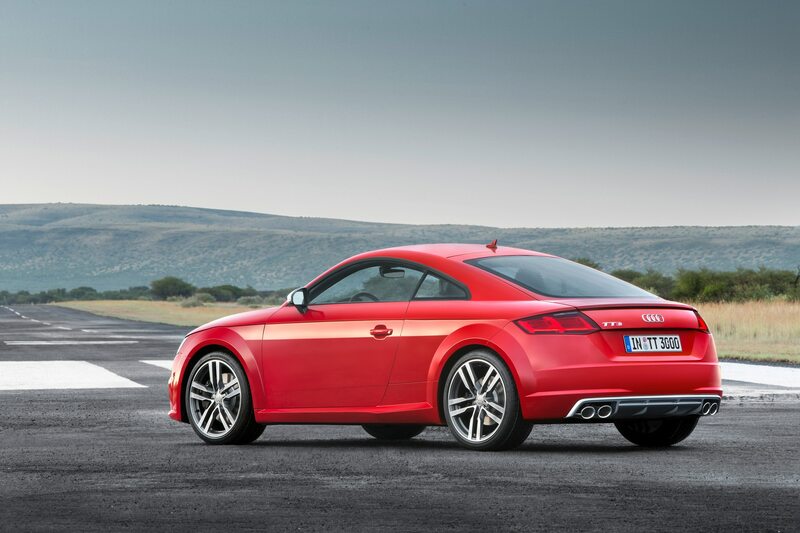 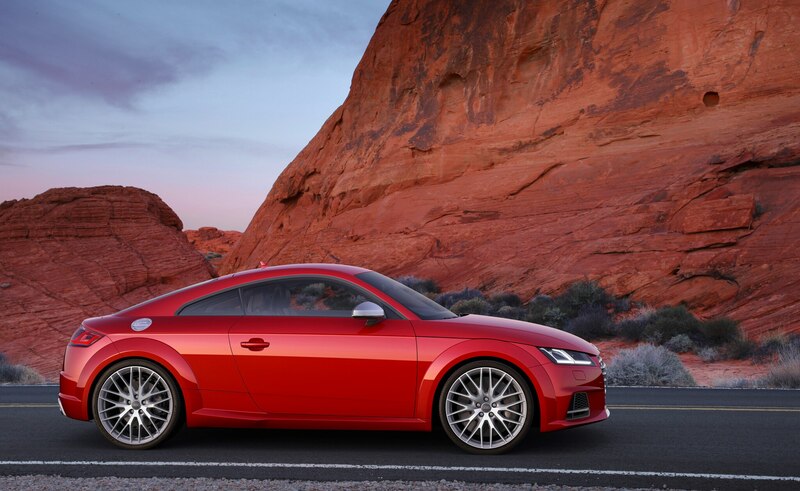 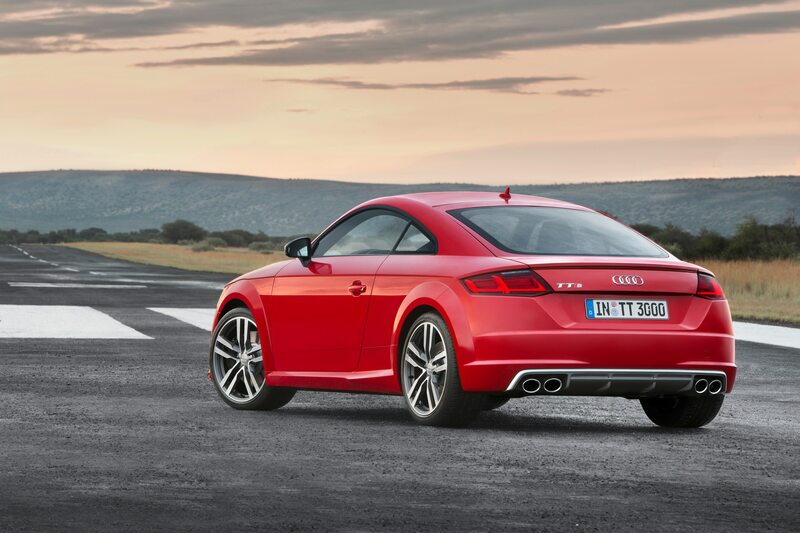 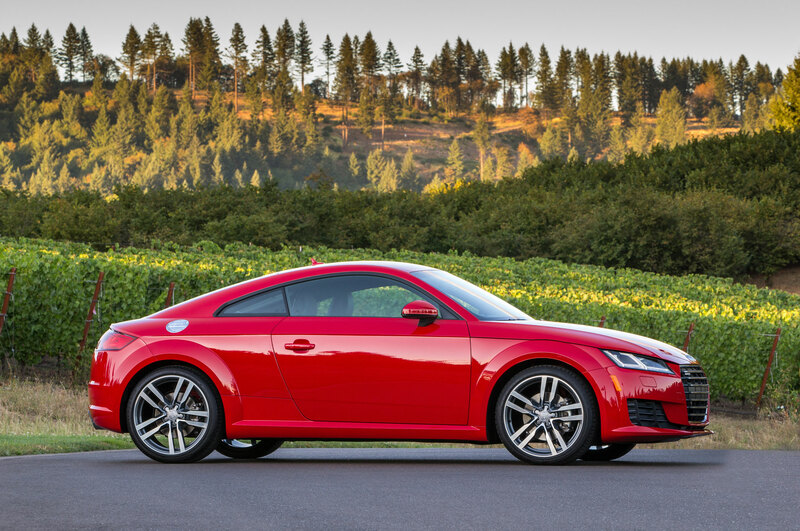 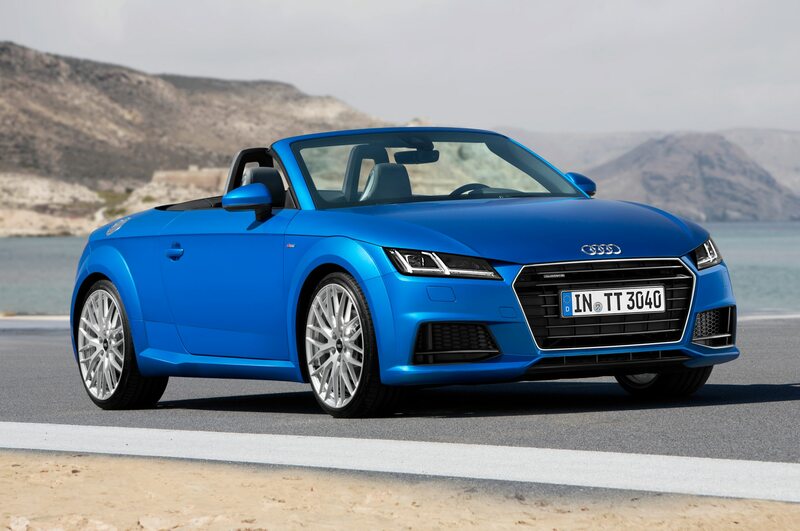 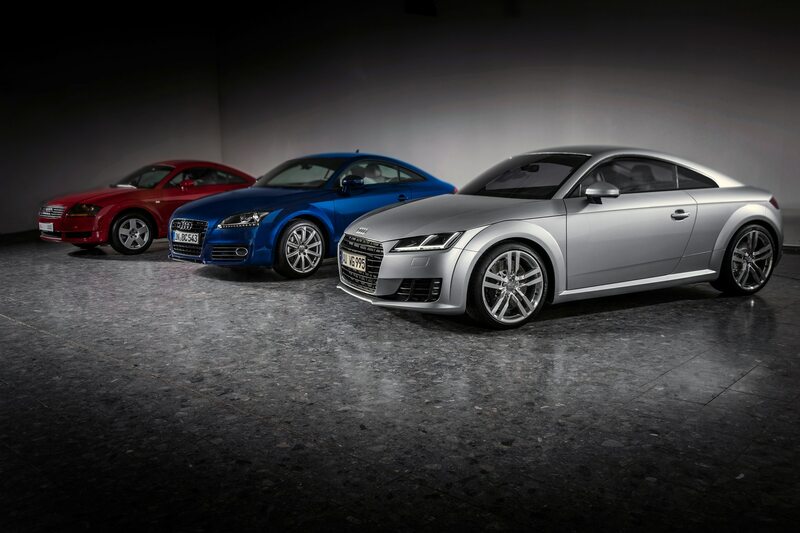 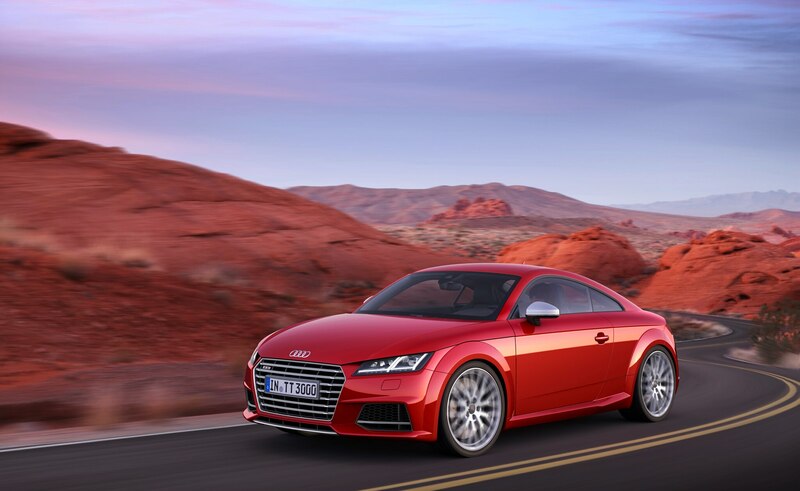 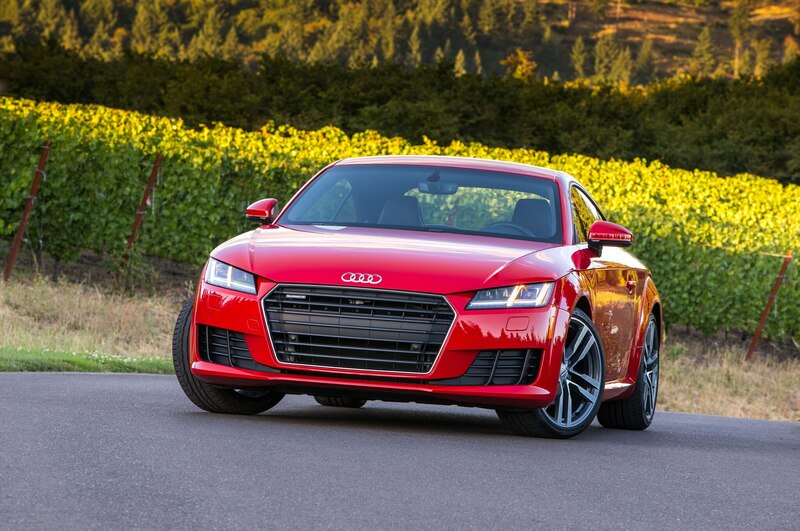 The new Audi TTS truly stands tall at the R8’s side with a brisk 4.6 seconds from 0 to 60 mph. 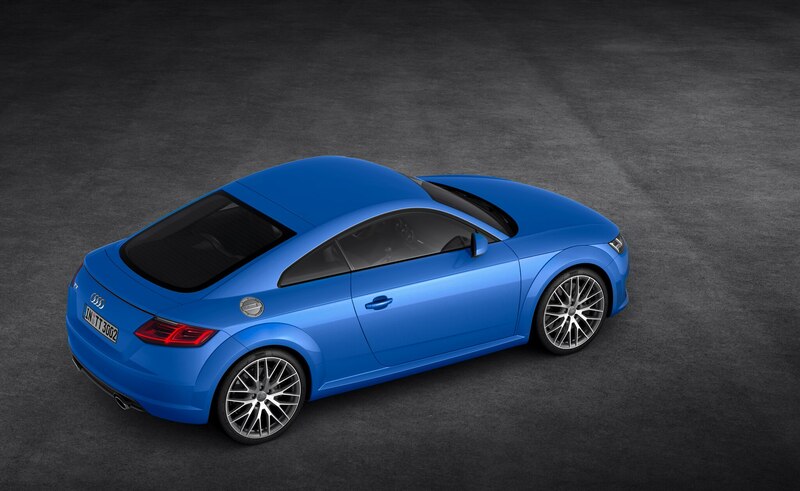 (Expect a TT RS at some point as well). 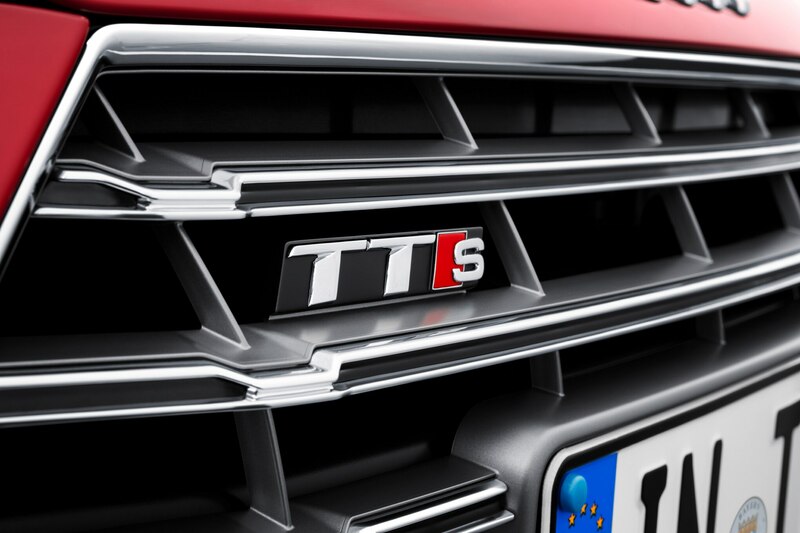 The TTS will also be available with a magnetic ride suspension option in an effort to further improve its road holding. 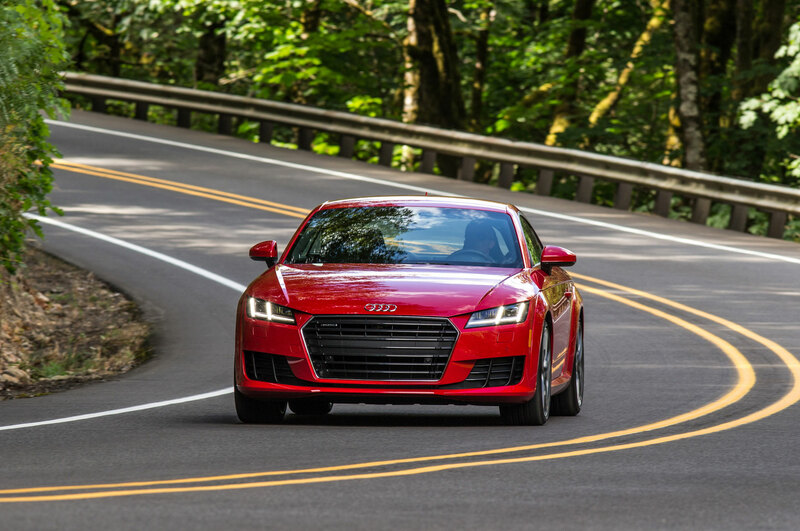 The TTS also comes with larger front and rear rotors, which we could have used while getting rowdy in a TT Roadster through an intense, snaky stretch that overheated our brakes. 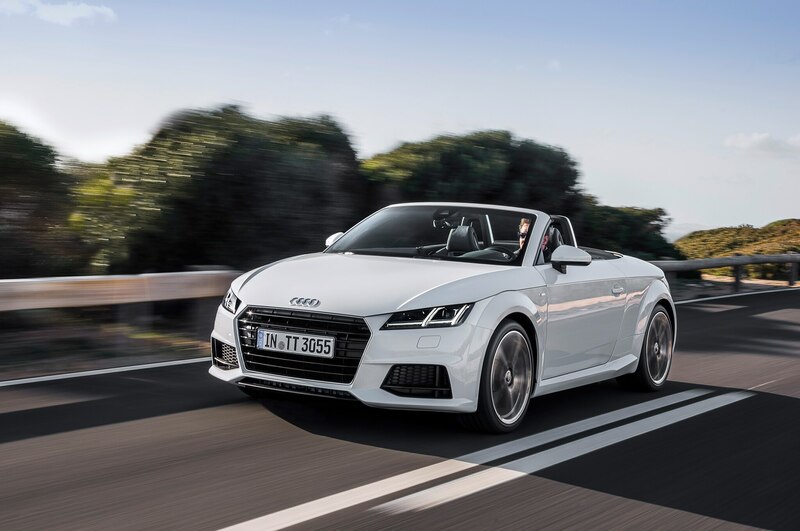 (For the record, the short stint in the Roadster was enough to know it’s just as fun as the coupe, with a 10-second top operation and a rigid feel with the canvas lid below deck.) 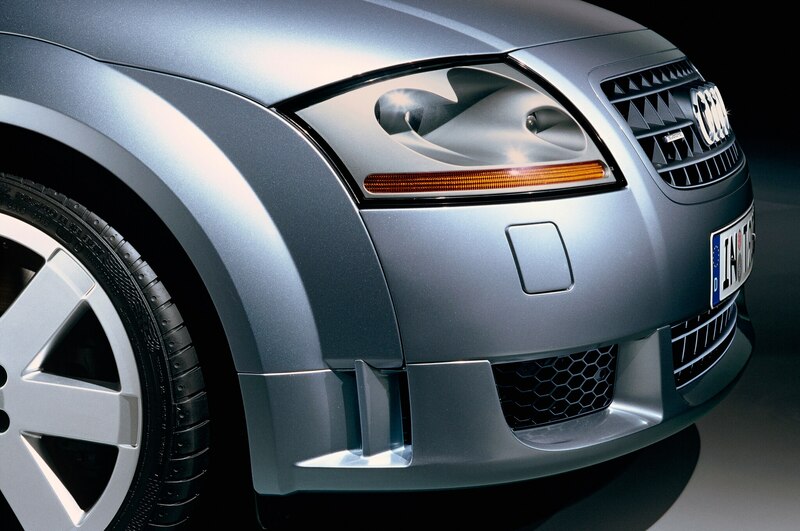 The brakes are bigger than before, however, so they stop hard under most day-to-day situations. 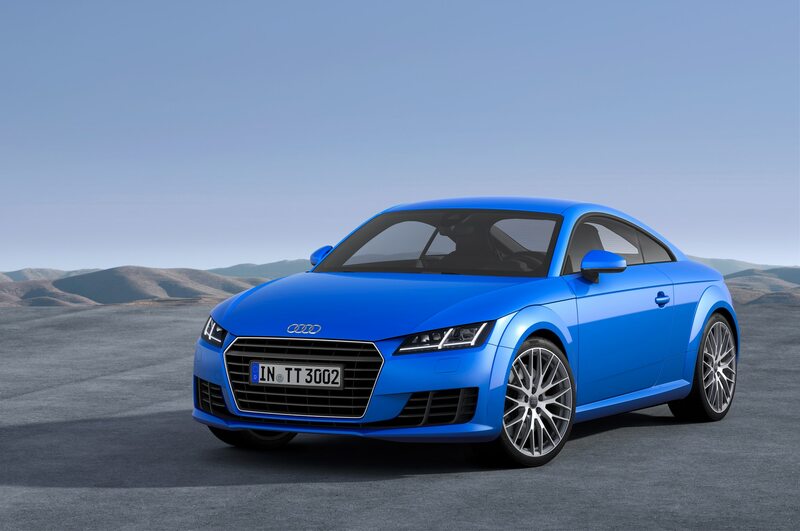 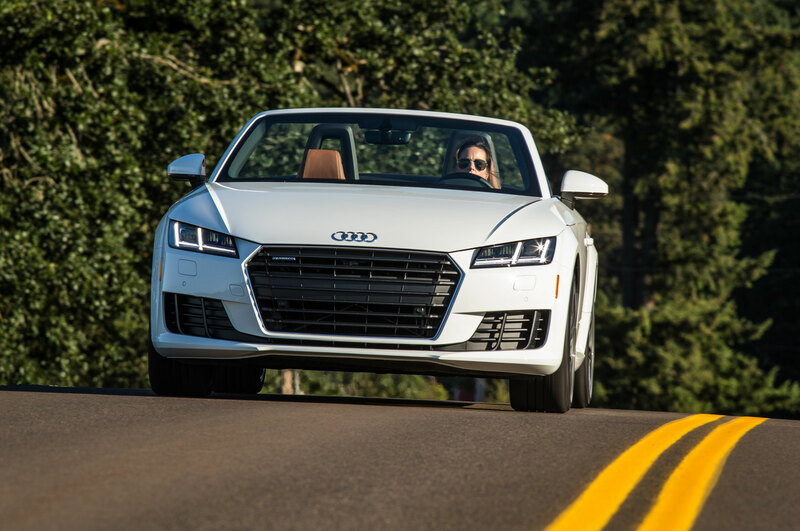 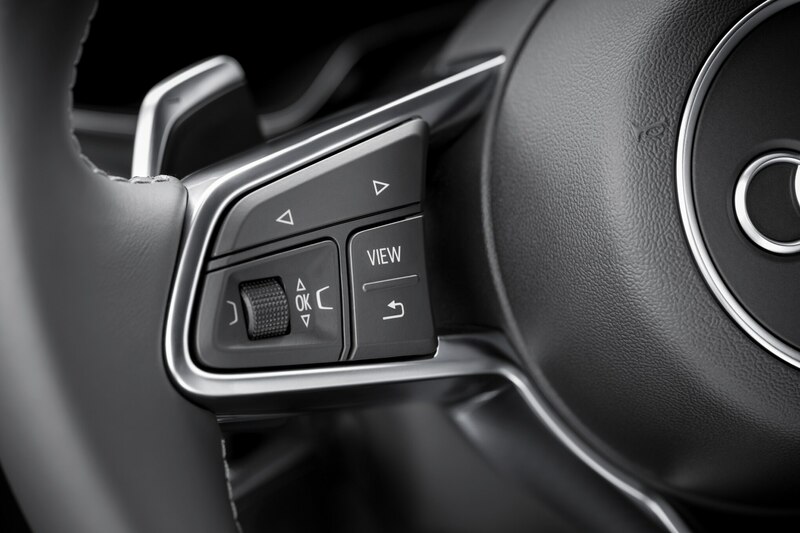 Inside, there are dramatic changes to the 2016 Audi TT, specifically to its infotainment system. 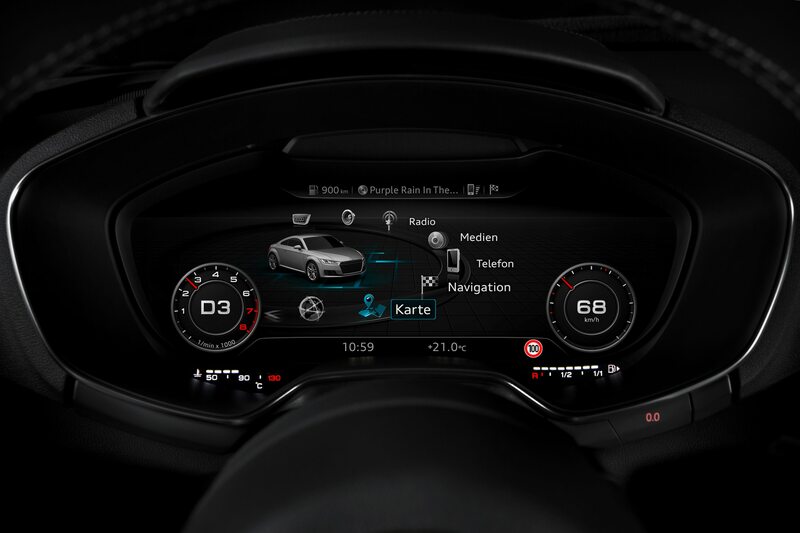 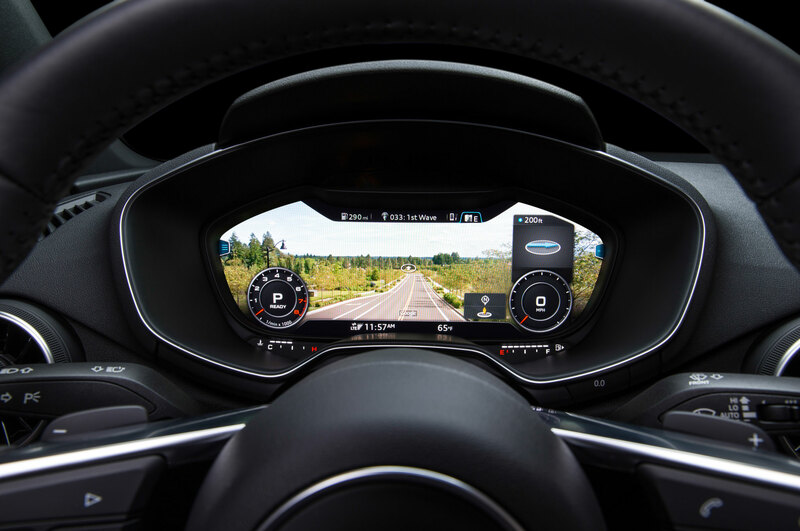 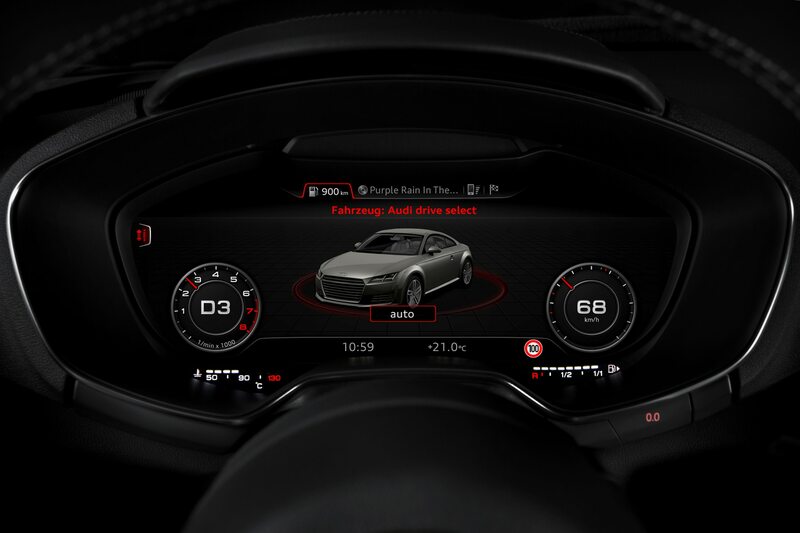 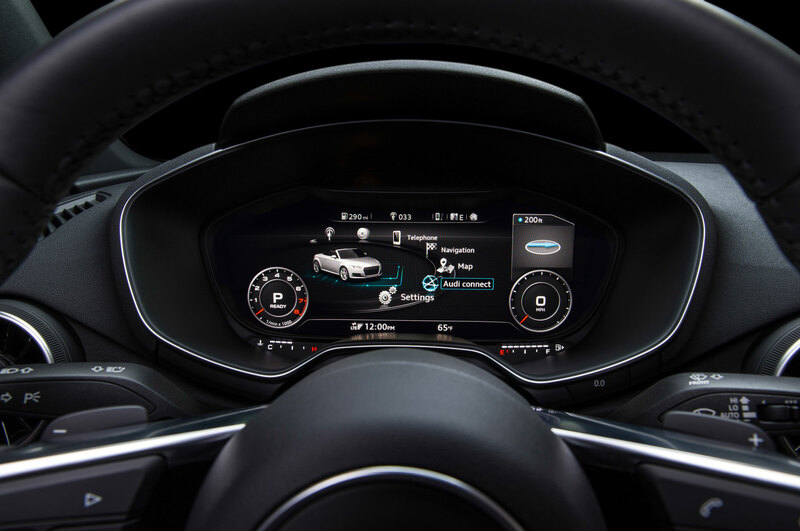 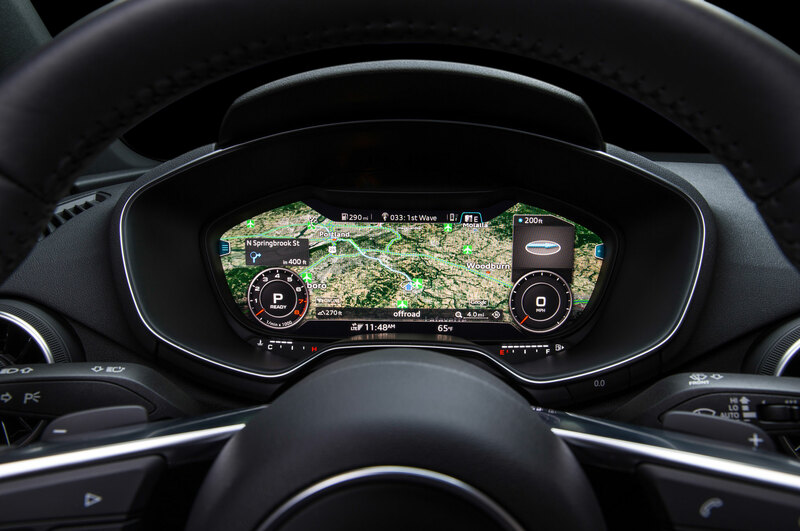 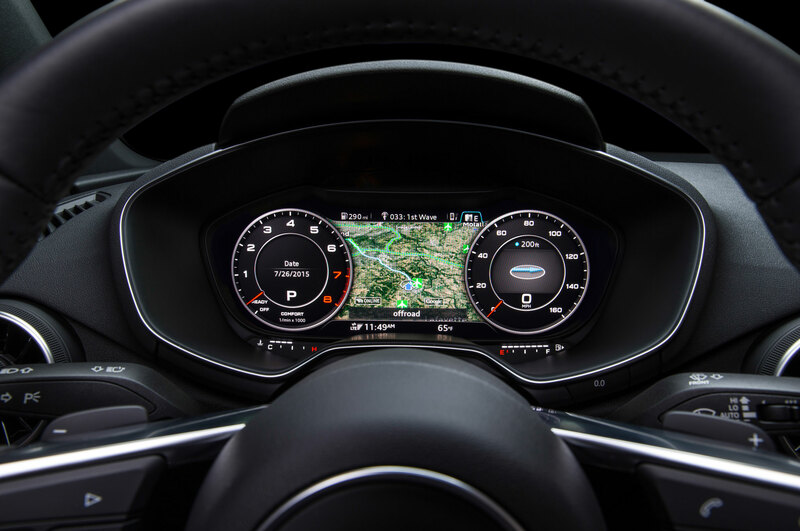 A 12.3-inch screen with high-resolution 3D graphics sits squarely in the instrument panel and serves as the primary point of contact with the vehicle. 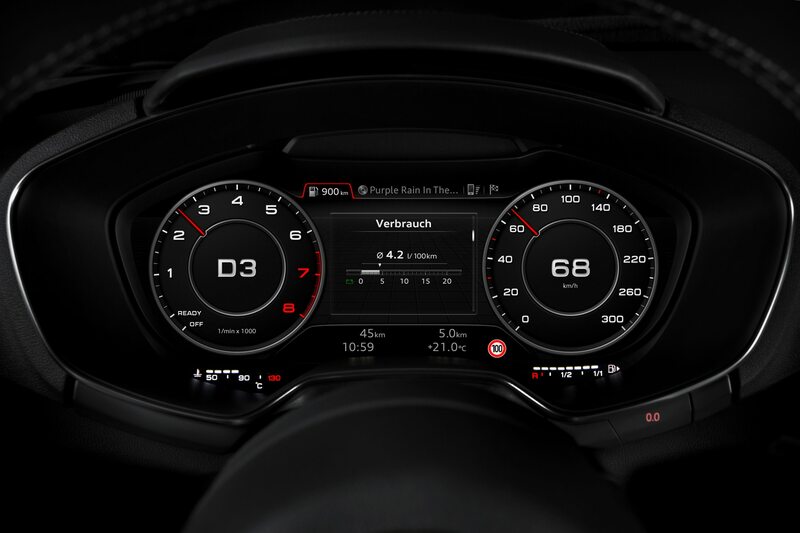 The driver can call up just about any function via steering wheel buttons and scroll wheels, although there is still a familiar multi-function controller in the center console It’s a neat piece of kit available only for the TT and the R8 that you can impress your friends with as you toggle among screens or switch the speedo and tach displays. 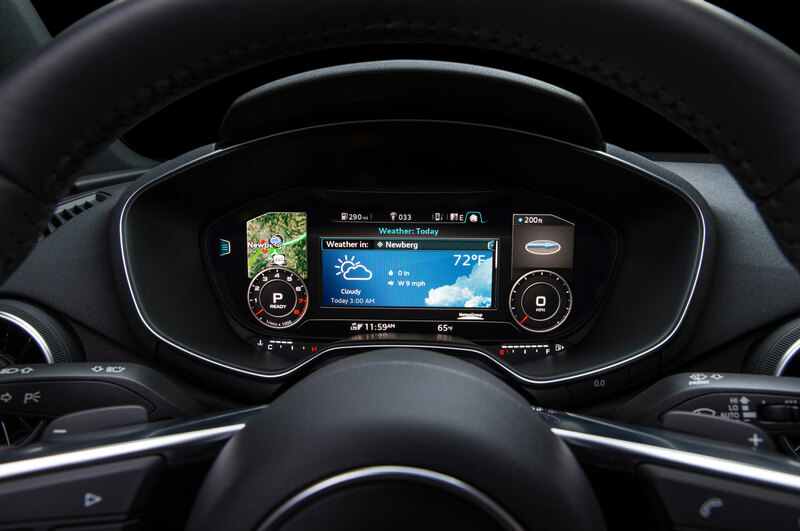 New in-car technology can look slick but be a disaster to use (see the first iterations of Cadillac CUE and MyFordTouch). 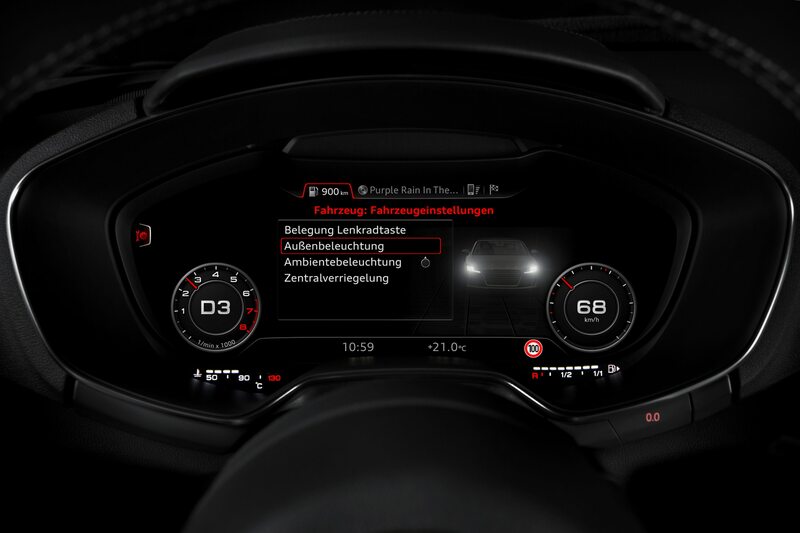 Accordingly, “there was a lot of sweating” by the MMI engineers, according to Mathias Halliger, the chief architect of MMI systems for Audi AG, both to optimize Virtual Cockpit’s graphics packages and to make sure the whole system worked seamlessly with the vehicle. 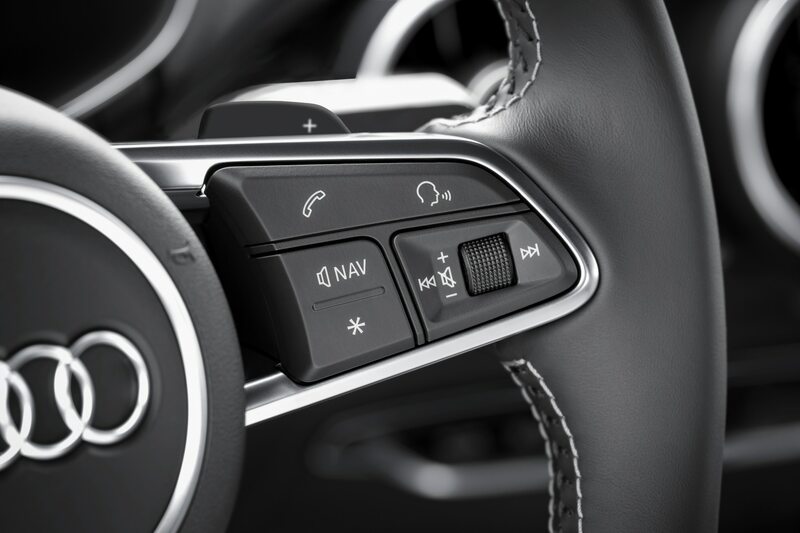 After learning the controls, it becomes a second-nature experience. All that geeky engineer sweatiness paid off. 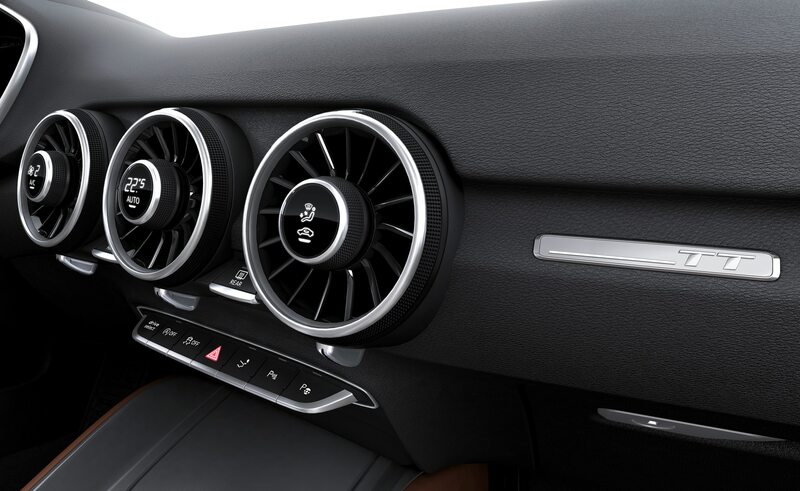 As for the rest of the cabin, it’s a little strange not having a traditional center stack. 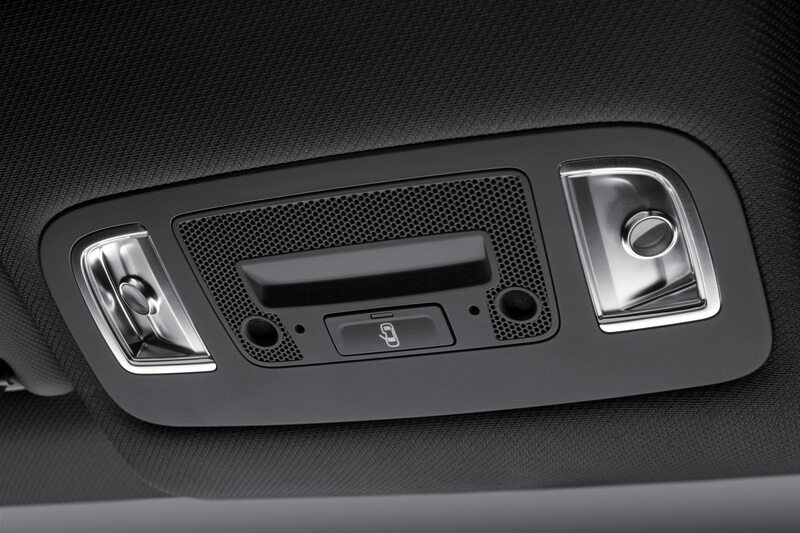 Front seat passengers are greeted primarily to a huge expanse of dash (look from above, though, and there’s a wing profile, like, you know, like an aircraft!) 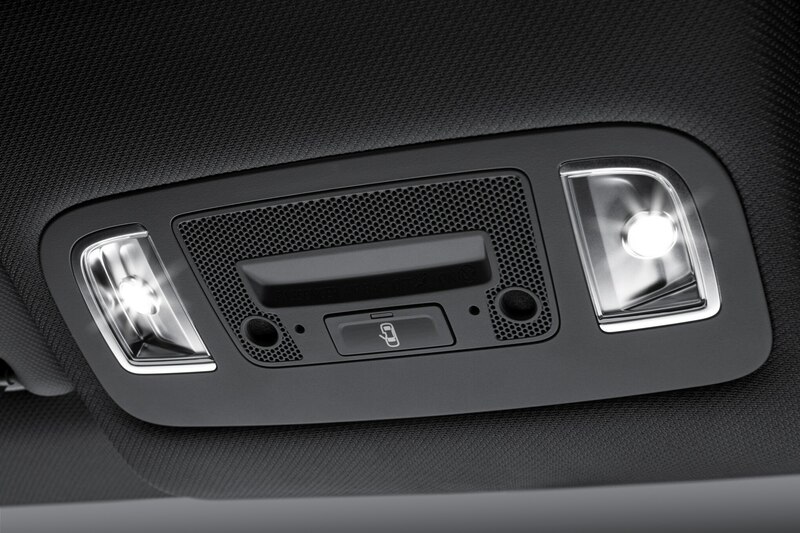 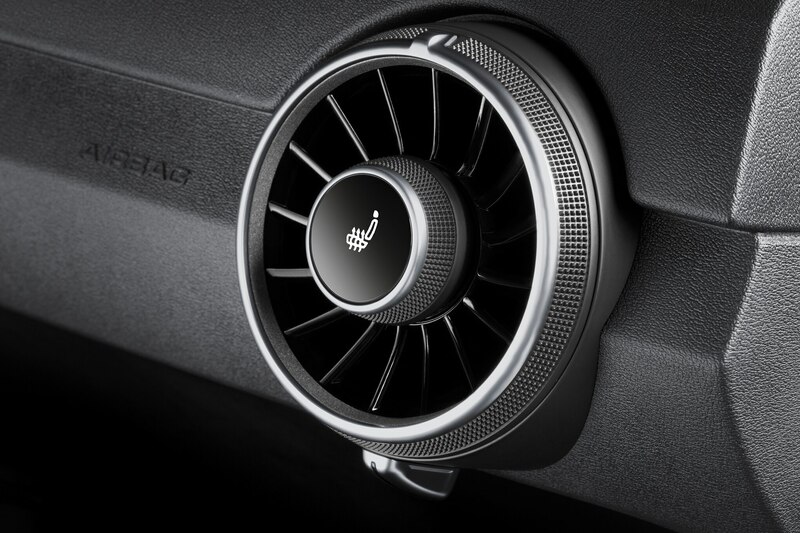 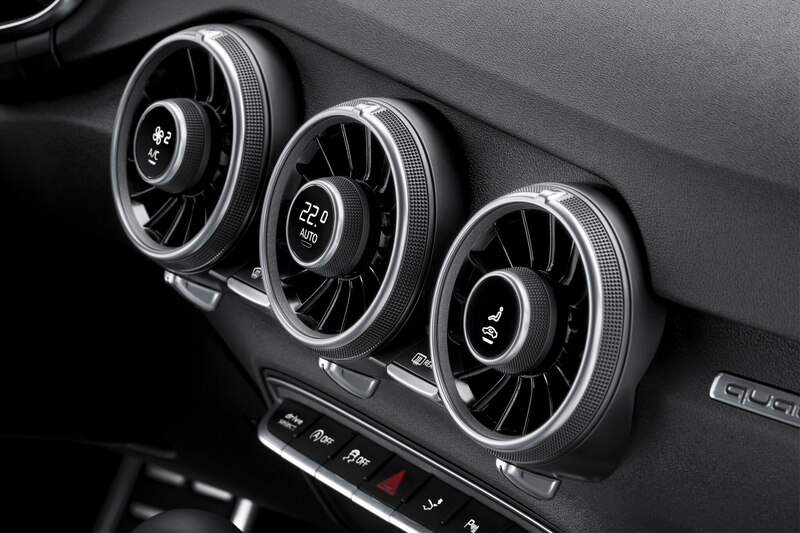 and turbo fan-style air vents with the controls neatly placed in the center of the vents. 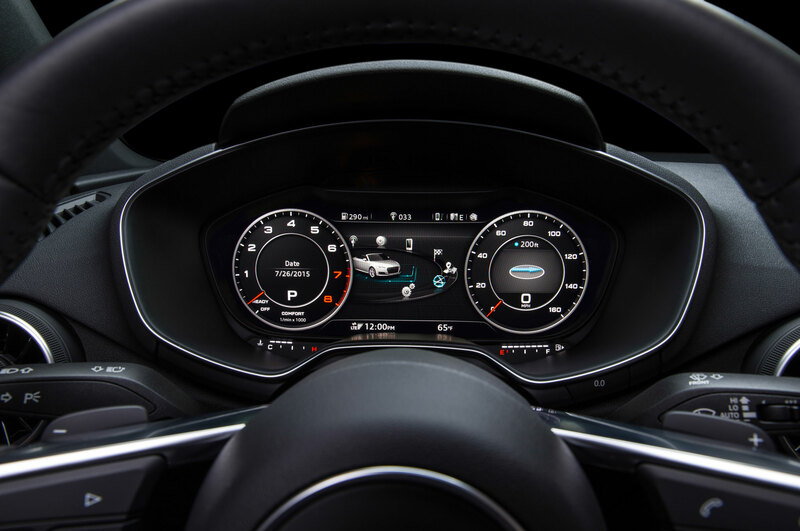 That said, the instrument panel screen is crisp enough so that passengers will be able to see most of what’s happening by glancing through the steering wheel. 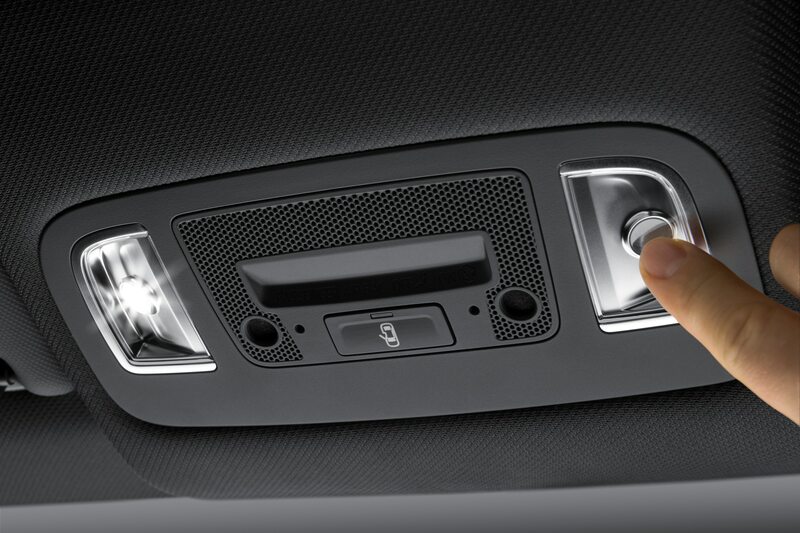 There’s a front cubby that can hold a couple of phones with a USB charging port, and decent cupholders. 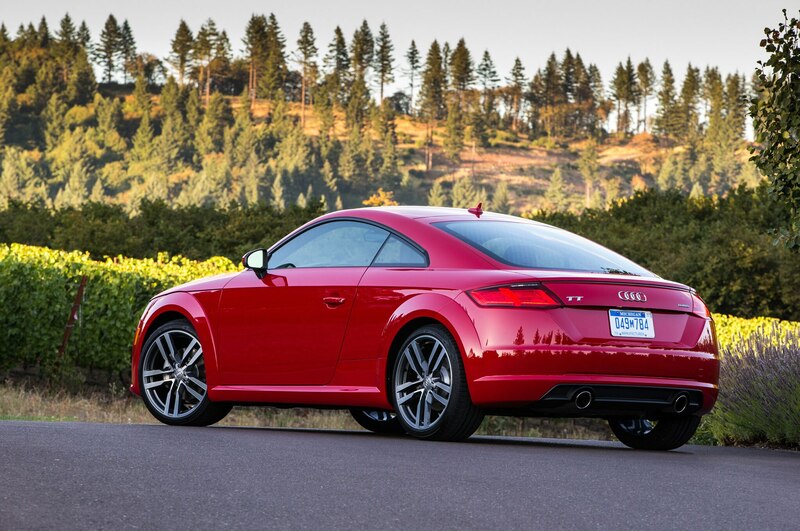 We suggest upgrading to the comfortable and supportive S sport seat option ($1,000). 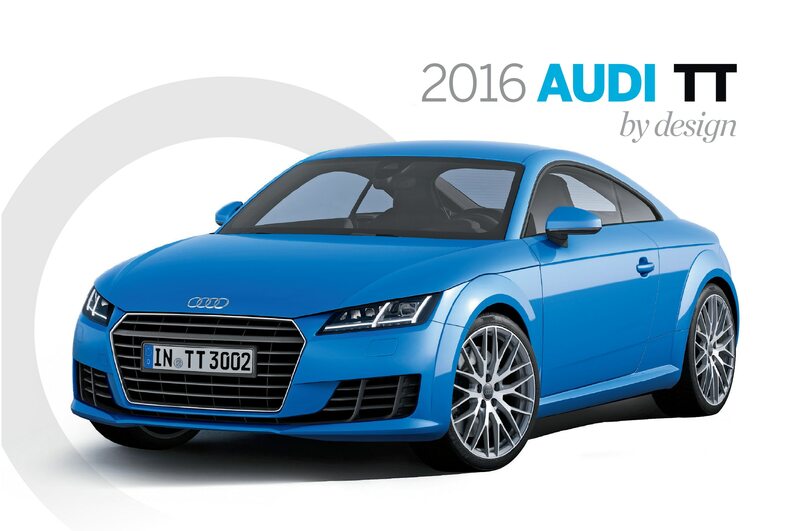 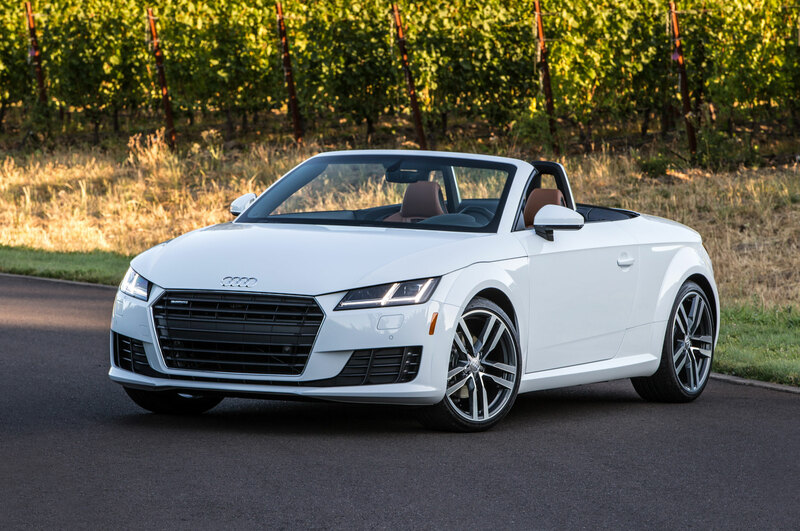 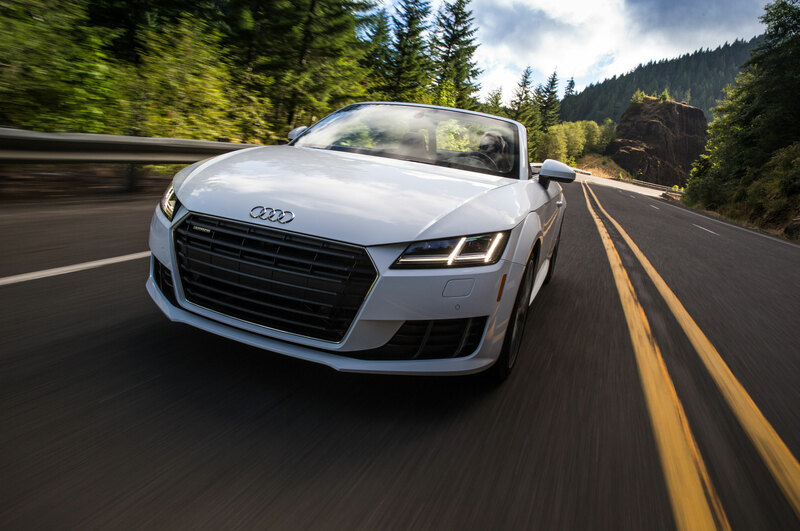 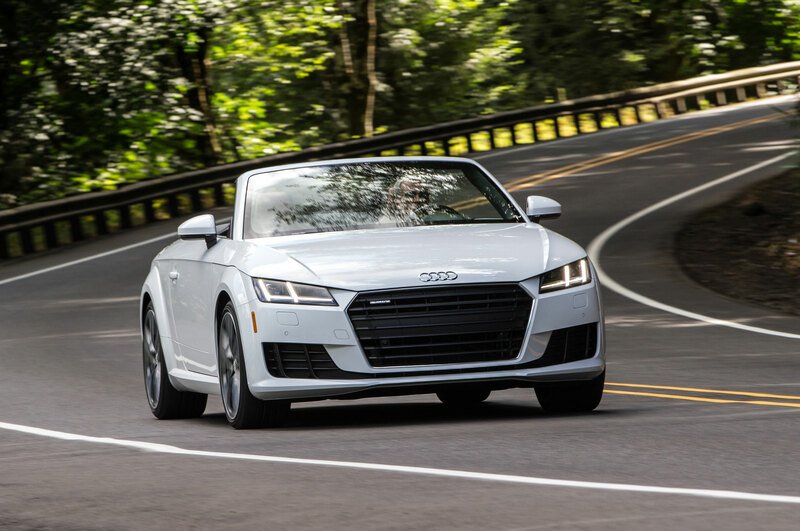 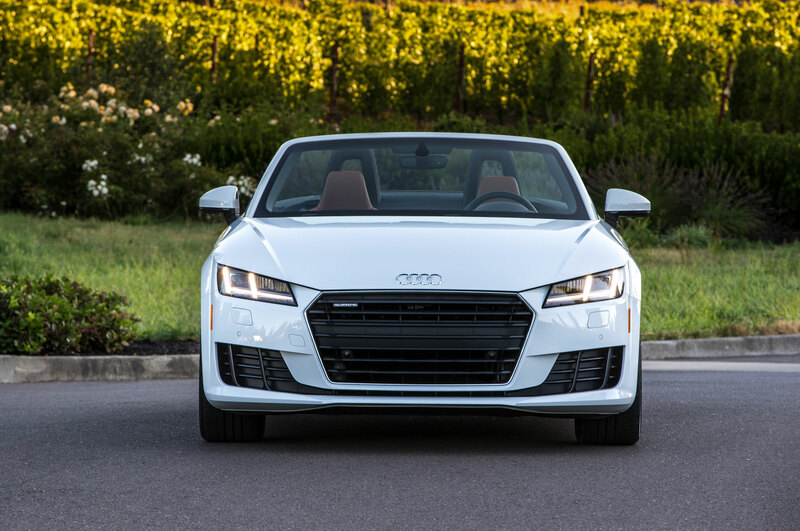 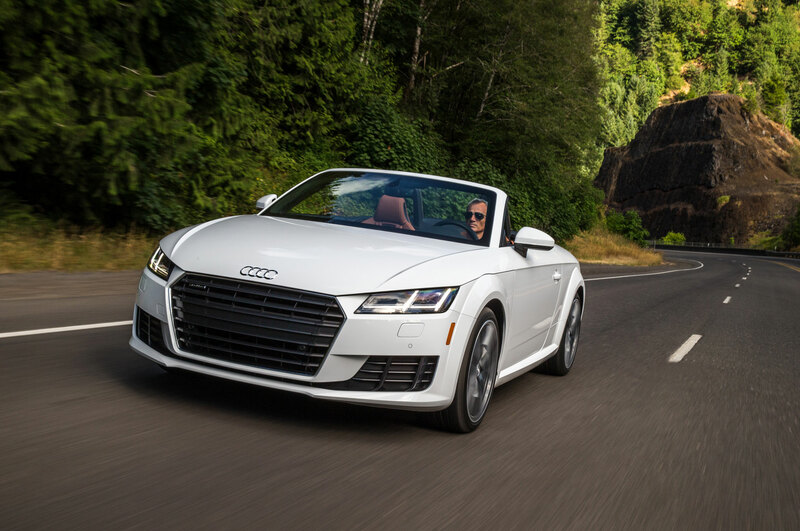 Taken as a whole, the 2016 Audi TT is a much better driver’s car than before, its interior and infotainment system is the class of the class, and the exterior is the best looking yet. 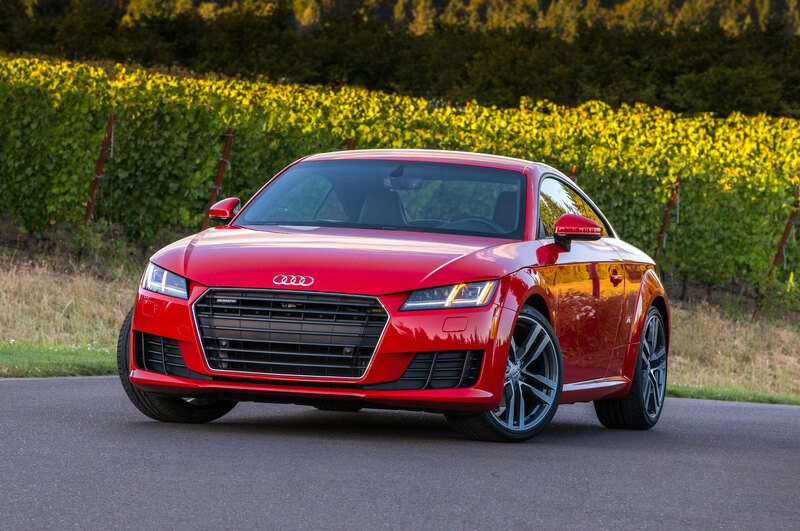 It’s also relatively affordable given its segment and mission as a luxury sports coupe at $43,825 to start, and well-equipped with just about everything you could want added at $50,600 (that’s almost three grand less than the base price of a Cayman). 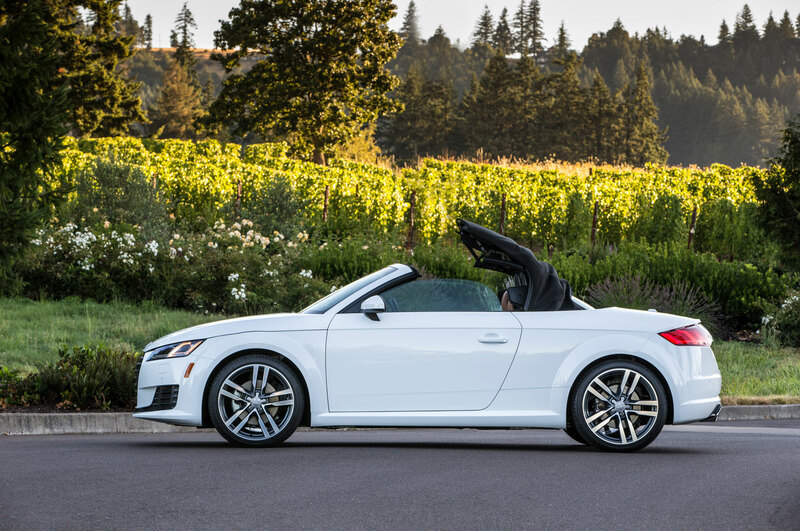 And it’s just about perfect for a day at the lake.